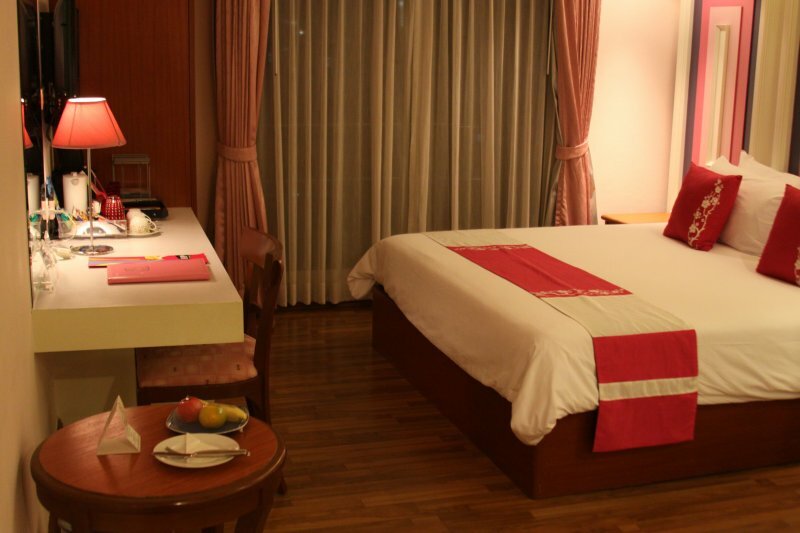 Bangkok offers lodging for all budgets. 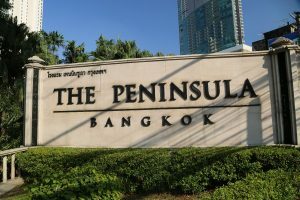 Bangkok hotels, guesthouses, world class hotels? Try some of the best hotels in the world. Bangkok is your city. We have personally stayed at most of the listings on this page from budget, to mid range to luxury. Keep the suggestions coming!! (Email Dave) and he will try to stay in as many of these hotels as possible. 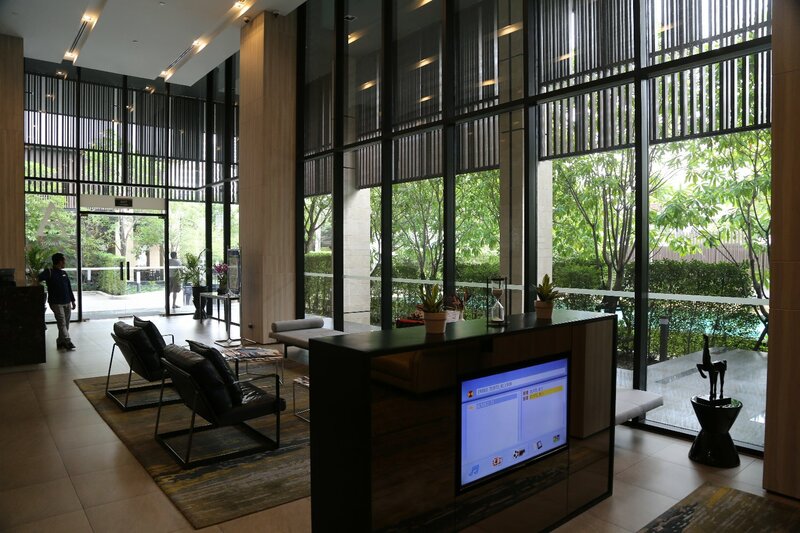 We do not provide reservation links to third parties on this page for any of the hotels/guesthouses listed below – rather we provide the direct hotels’ phone, website and email if available. 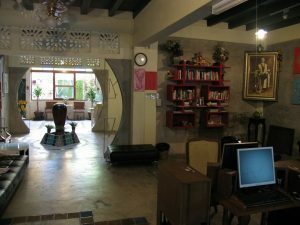 NOTE: You can do a search online for “Bangkok Hotels Hostels” or some similar phrase and many of the same guesthouses/hotels who are Internet savvy or who have partnered with larger hotel reservation websites will show up on every search. As a result, those hotels are often full or more expensive then places you can find just by showing up. Because of this, a number of the hotels we list below will not show up in a general Internet search for Bangkok hotels. 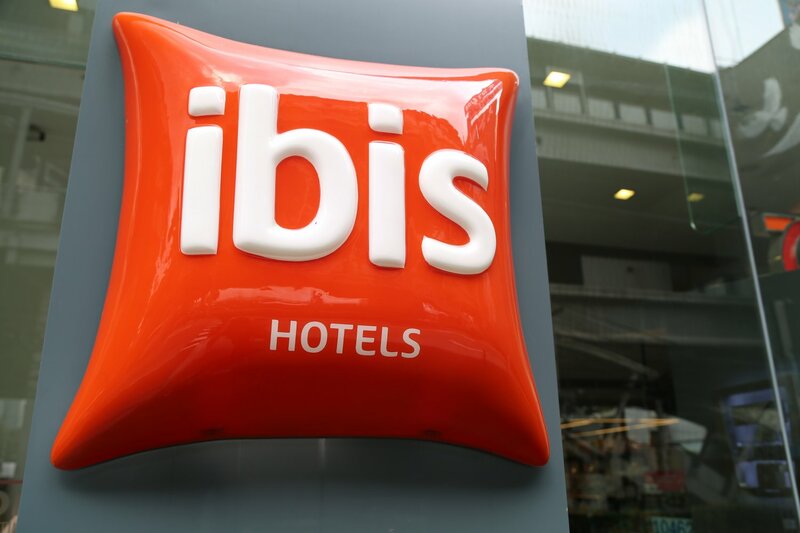 We have personally stayed in nearly all the hotels or hostels listed below. Look for the following icons next to hotels we feel strongly about, either in a positive or a negative way. 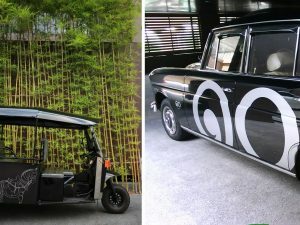 These hotels are unique, are a good value for the price, have excellent customer service or have additional desirable characteristics that set them apart from the competition. 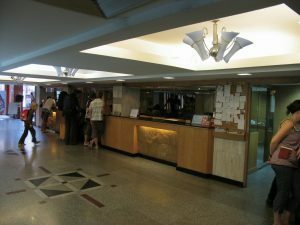 These are hotels that based on our stays lack customer service, are overpriced and or have other noticeable faults. We first heard about TenFace Hotel from Neil Mandt (who we interviewed); Neil directed and starred in a movie called “Last Stop for Paul”, part of which was filmed in Thailand and he stayed here during some of the filming. 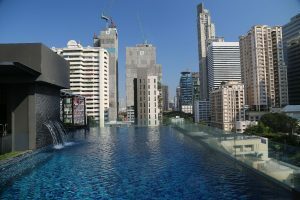 This is one of the trendier boutique luxury hotels in Bangkok and is an extremely good value for the price. 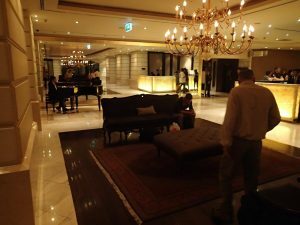 We recently stayed here for several nights and found quite a few features that set this hotel apart from others in its price range. We measure a hotel stay in the “details” and it is those details that can quickly add up to an overall enjoyable experience. Check-in was about the fastest we’ve ever experienced! The elevators are also super quick. 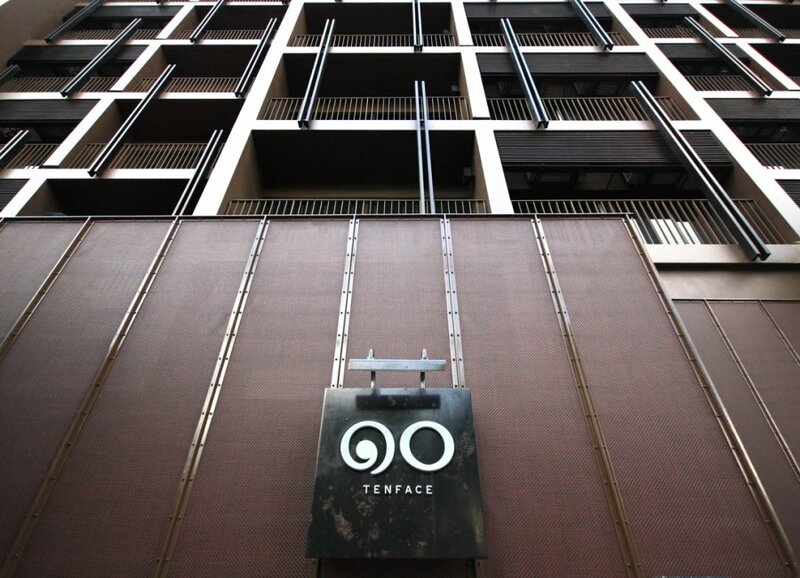 Tenface has only 79 suites. 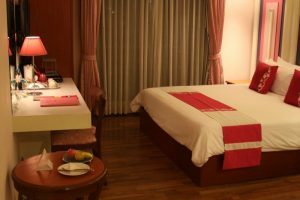 Even their smallest rooms (the one room suites) are quite sizeable by Bangkok standards. Tenface also offer several two bedroom suite options (which include a kitchen). The hotel is named for the ten-faced giant from the Thai national epic, Ramakien. The entire hotel plays upon this theme including their “Tosakan’s Heart Box” which is given upon check-in. 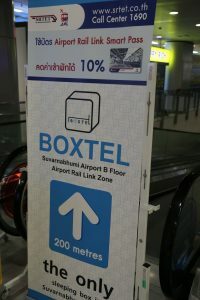 This box contains a complimentary BTS Skytrain Day pass, a local SIM card for your cell phone, the use of a Nano Ipod for the duration of your stay as well as a “must see places” guidebook including local recommendations as well as cards of select attractions written in English as well as Thai to give taxi drivers (an important feature!). 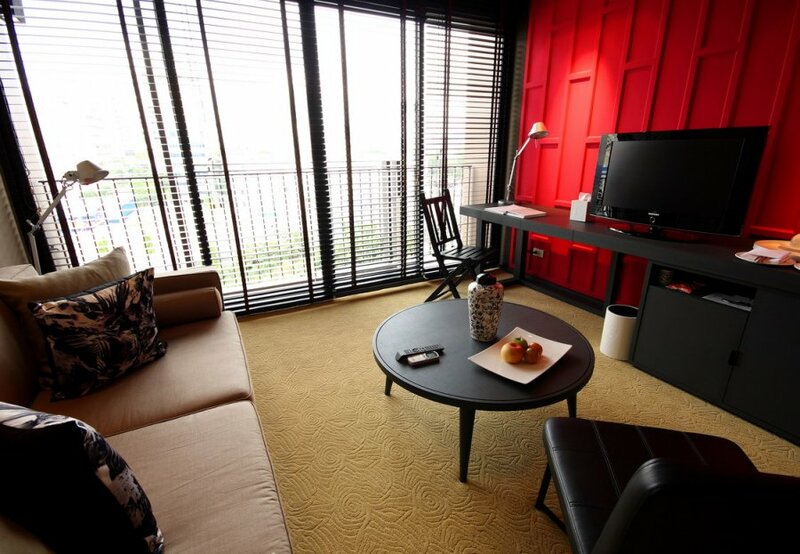 Each suite has its own router for fast complimentary in-room WiFi. The rooms are stylishly decorated and the beds as comfortable as you will find (Tenface provides one of four different pillow types upon request!). Hold your mouse over each link below to find out about each particular Bangkok district. Click each link below for hotels & guesthouses in that particular district. Thailand’s country code is +66. Chao Praya River is the lifeblood of Bangkok. It is a huge brown river and winds its way among all the temples and buildings – canals run into this main river. Sometimes the Chao Phraya provides at least a breeze to help break up the sometimes heavy humidity. Longtail boats and river taxis ferry passengers up and down and across this river. Major temples are located near its banks including Wat Arun, Wat Po and the Grand Palace. 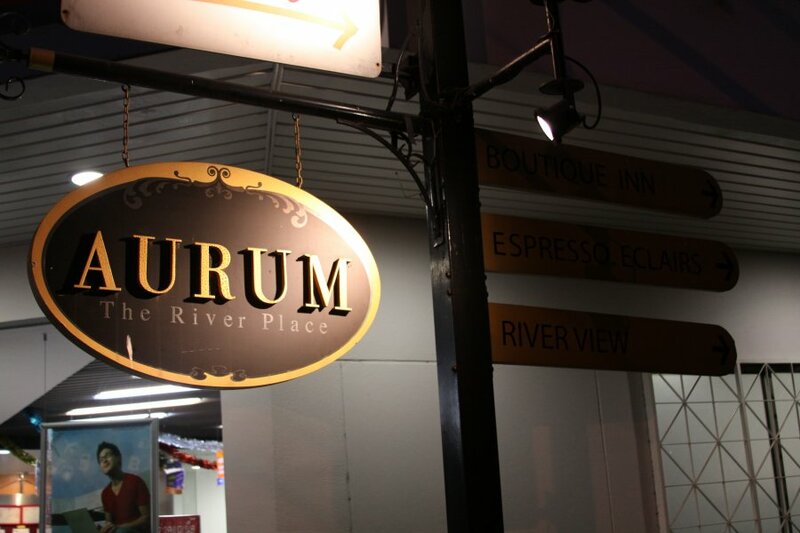 Aurum, The River Palace is located within minutes walking of Wat Po and the Grand Palace on a small Soi right next to the Chao Phraya River. It is located in the original heart of Bangkok’s commercial and cultural district. 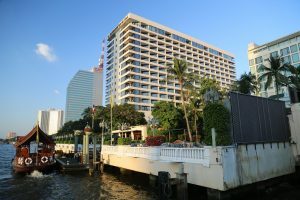 Oriental Hotel What can be said about the Oriental Hotel other than it is among an elite class of hotels in the world and is certainly considered one of the top hotels in Bangkok. Old World elegance is a phrase that easily describes this hotel. 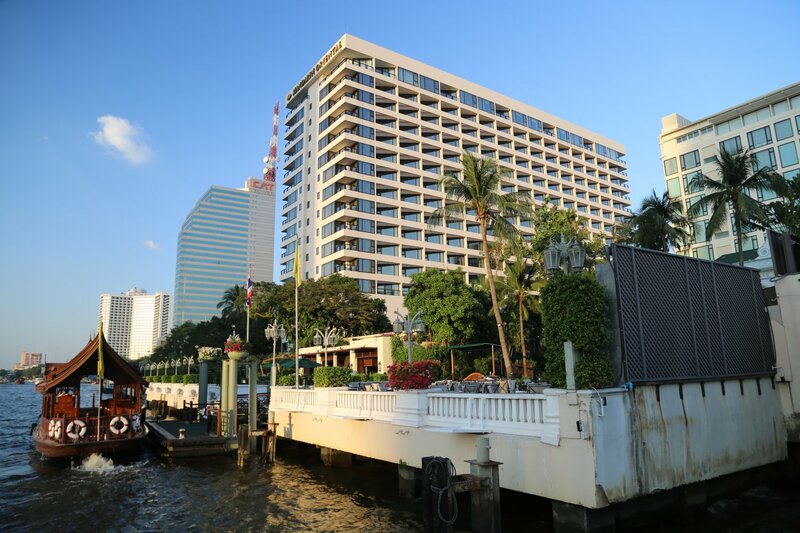 This exquisite historical hotel celebrated their 140th year anniversary in 2016; they are located right next to the French Embassy and also the Chao Phraya River (in fact they have their own pier on the river appropriately named, The Oriental Pier). For a hotel of this caliber the room prices are actually quite reasonable. 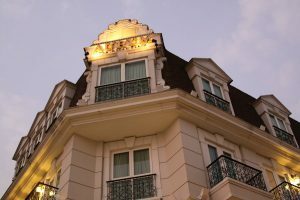 Transplant this hotel to another city such as New York, Los Angeles, Hong Kong or any of a number of other wealthy cities in the world and the prices per night would be absolutely exorbitant. 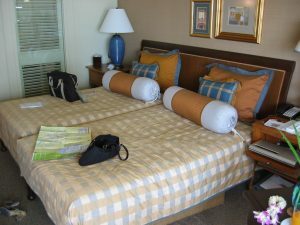 Here, rooms start at about $350 per night US $ although during the ‘off season’ prices may dip lower for the deluxe rooms. The service is absolutely impeccable – the employees are friendly extremely attentive, and they anticipate your needs quite well. 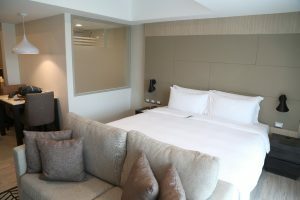 The rooms are well designed and there are great views of the river and the surrounding areas depending on which side of the hotel your room is on. Each section of the floor has a butler available on your call. 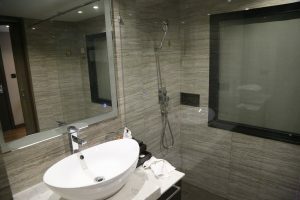 A surround sound Bose driven speaker system is available and controls are next to both sides of the bed, in the bathroom, and next to the toilet. Fresh OJ and a morning paper are delivered every day. A small pullout “office” is available with a high speed Internet connection, phone and fax machine. Woodlands Inn is a budget hotel – visit: www.woodlandsinn.org It is a little dingy and they did not accept credit cards (even though their website indicates they do – so bring cash. This hotel has undergone an upgrade so hopefully the quality of rooms have improved since we stayed here. It is overall clean and provides a safe nights sleep. 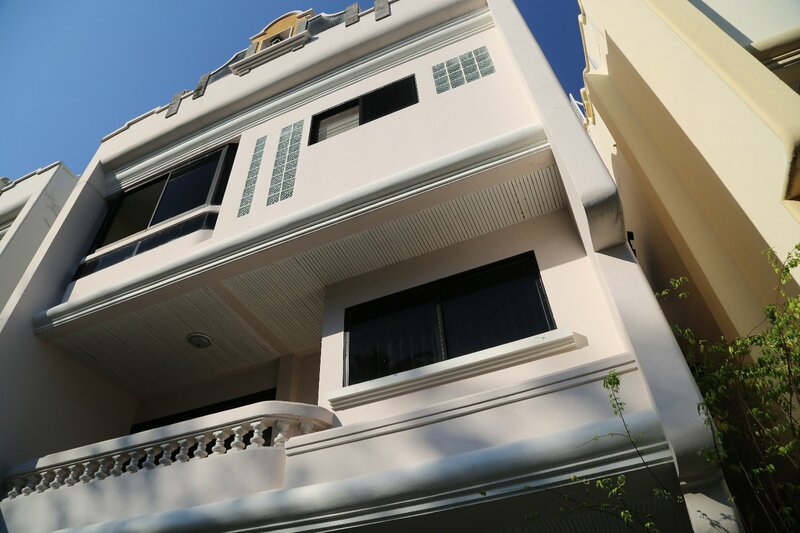 Located about 500 meters from the Chao Praya River and approximately 2 kilometers from the nearest Metro stop Hualumphong. 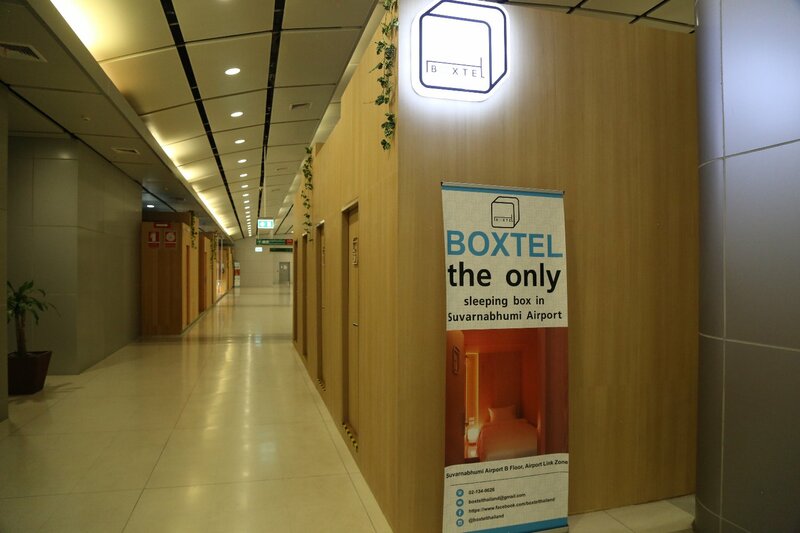 Airports These are hotels that are typically within about a 20 minutes drive or less to either Suvarnabhumi Airport or Don Mueang Airport. 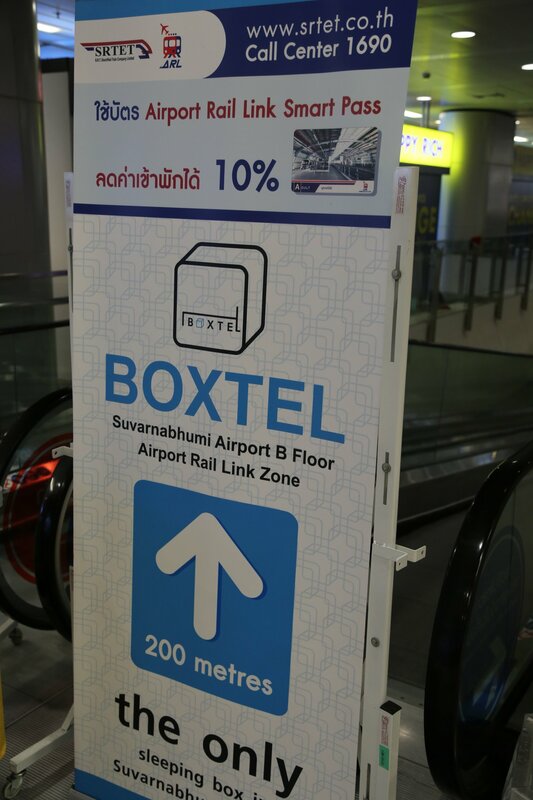 Suvarnabhumi Airport is Bangkok’s primary International and Domestic Airport. Don Mueang was Bangkok’s main International airport before Suvarnabhumi Airport was built. Don Mueang still services a number of airlines for both domestic and International routes – including Air Asia and Nok Air. Boxtel, Suvarnabhumi is located on the basement level of the airport about 200 meters past the Airport Rail Link terminal station. Even if these tiny sleep pod like boxes were not located here, this part of the airport is among the most popular places to sleep between flighs – with travelers often cramped into seats or lying on the floor. However, Boxtel gives you enough room to stretch out with privacy. Sleep based on the time you have – either connecting for flights or upon arrival or departure. Super conveniently located. 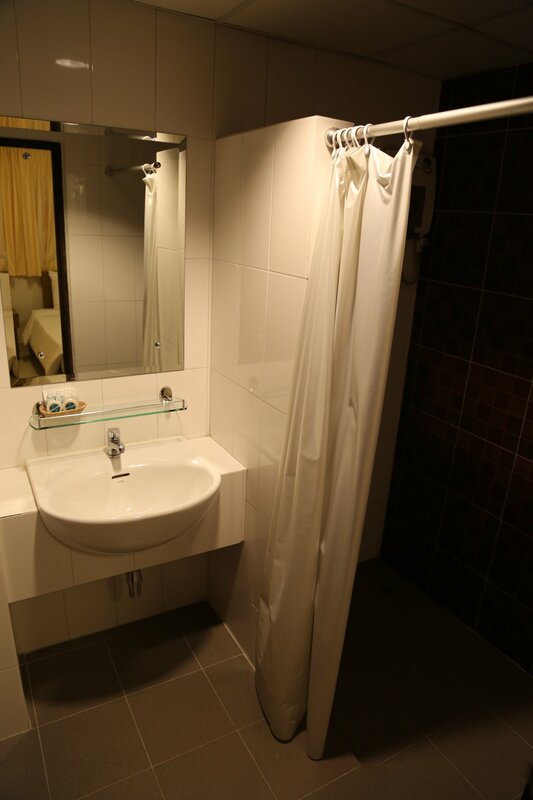 Rooms are booked in 4 hour increments – note that there are no showers on site and bathrooms are shared. Main pluses of a stay here are privacy and convenience. 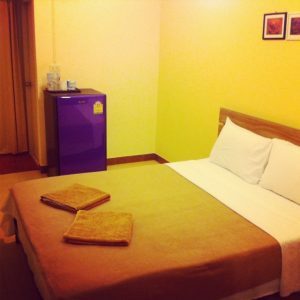 Typically pricier then most budget single rooms found if you go into Bangkok. Ivory Suvarnabhumi Airport Hotel Ivory Suvarnabhumi Airport Hotel is conveniently located about a 10 to 15 minute drive from the Suvarnabhumi Airport via taxi at 2/1 – 2/2 Ladkrabang 22 Ladkrabang (about a 20-25 minute drive to On Nut Skytrain stop with no traffic). 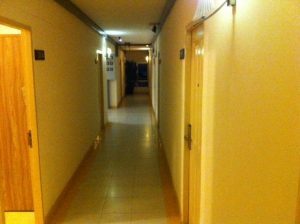 This hotel is a very good value for the price with a great location especially if you need to catch an early morning flight from the nearby airport. 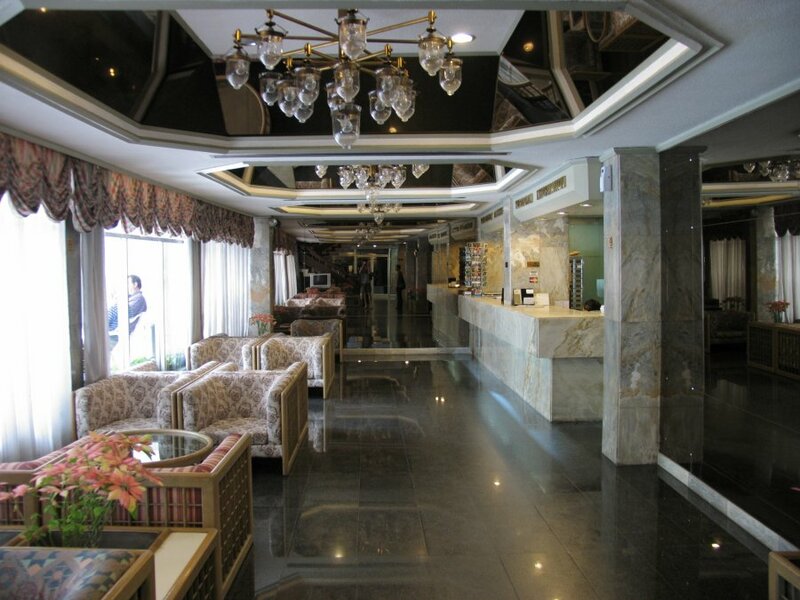 The hotel can also arrange transportation to and from the airport if needed. 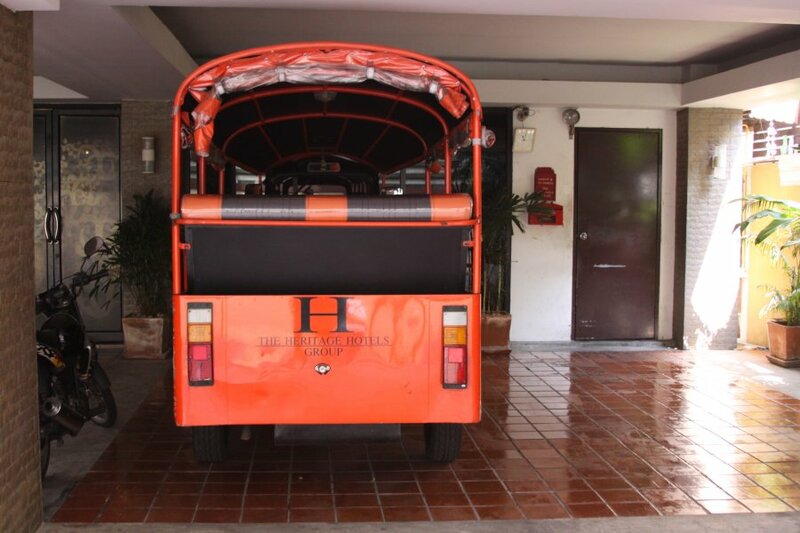 The staff are friendly (front staff speaks English) with a guy to take your bags up to your room when you arrive. The rooms are clean and comfortable with very firm beds. Wifi worked well during our stay. 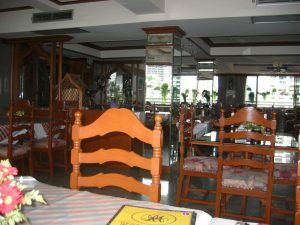 A small restaurant part of this hotel is located on the ground floor in the building directly across from the lobby. 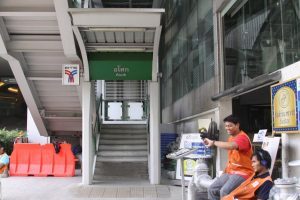 Newspapers in English and Thai are available in the outside waiting area (next to the indoor lobby). The showers are very confusing to use – one must turn on the facet located at the bottom of the shower, then press the large silver press pad on the actual shower installment and then supposedly the shower will turn on. It doesn’t always work this way based on numerous times and showers used when staying here. Montri Hotel & Spa is located almost directly across from Don Mueang Airport and if you are flying in or out of this airport, this hotel is very conveniently located and rooms are available at a decent price. 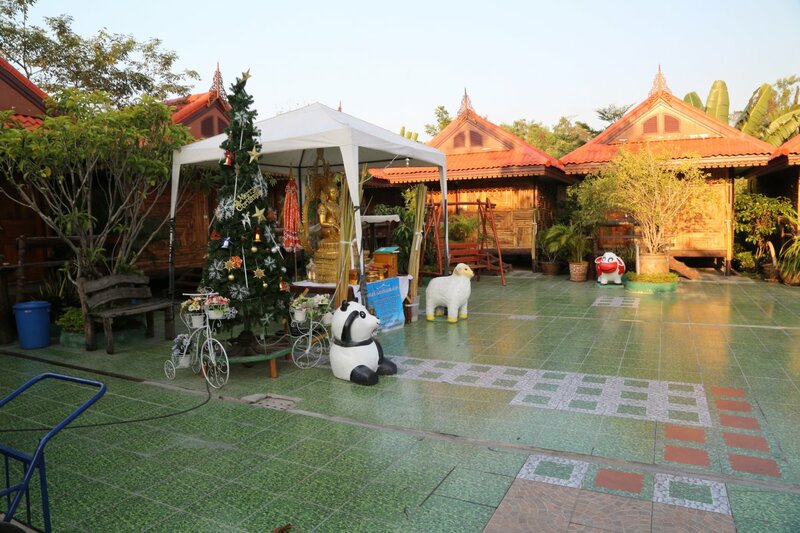 This resort is very much decorated and built in a Thai style. 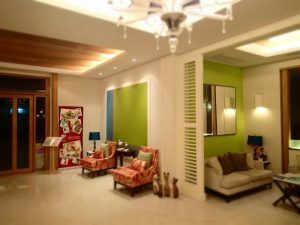 It is not a fancy resort – rather is very modest and makes a comfortable stay. 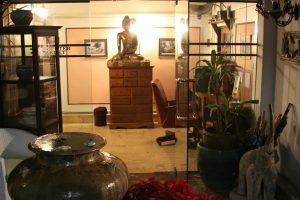 A small low key massage room is one site – and in our experience provides a very good massage. The rooms are clean and comfortable with good air conditioning. 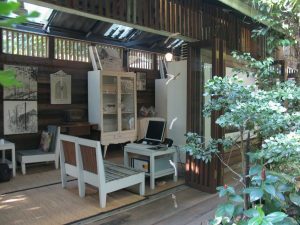 The grounds of the property are calming, as quiet as you can find in this urban oasis – there is even a little water wheel for calming flowing water sounds and birds in cages and an open courtyard for additional relaxation. Breakfast can be ordered in the morning – several light items are available including “joke” a type of porridge. The property can be very difficult to find – it is located on a small street (when trying to find have their phone number at hand so you can give it to your taxi driver or key in their address into Google Maps – this works fine and is the method we used to find their property). While located merely a little over a kilometer from Don Mueang as the crow flys getting to the airport can take a bit longer depending on traffic or if you walk. If you walk it is about 20 + minutes weaving through small streets and a busy part of town. If you drive it can take about 10 mins with no traffic as the driver has to go down a bit further from the airport and circle back. 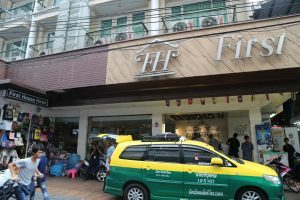 The hotel will reserve a taxi for you for about 50baht – or you can walk several blocks to flag one down on the nearby street (may be less taxis here in the early am and during rush hour you might have to wait some time before you can find an empty one). It cost us just over 50 baht to the airport using one of the taxi meters. During our stay the wifi worked very well inside and outside the room. Location: No.11 Soi Chang Arkart Uthid 3 Yak 4, Donmuang, Bangkok, 10210 Thung Si Kan.
Khao San Road/Banglampou is the heart of Bangkok for International backpackers. 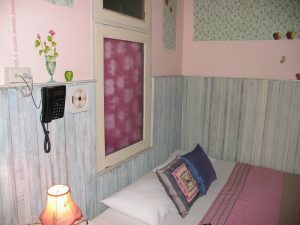 There are numerous small rather inexpensive guest houses and hostels on or near Khao San Road. 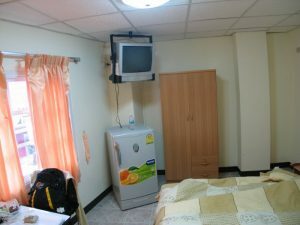 We have seen several in the 200 to 300 baht per night range – room with bathroom and fan (no AC). 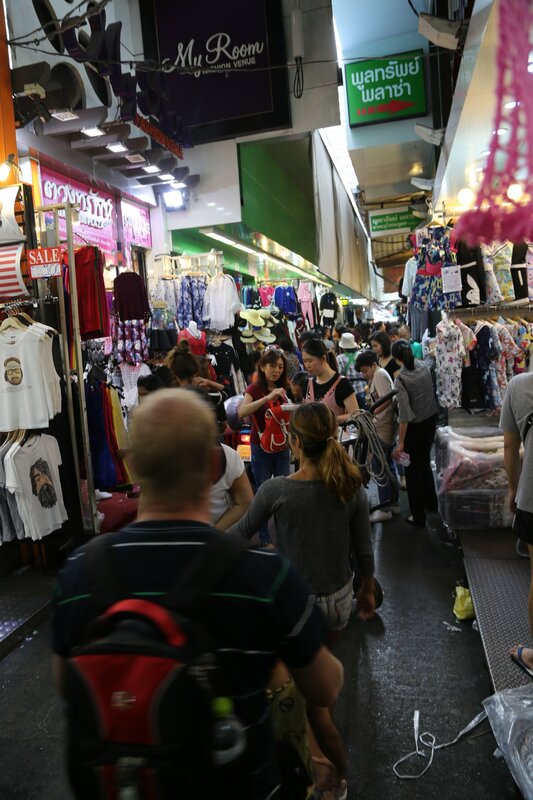 The advantages or disadvantages of staying on Khao San Road is that you are close to a strong International social environment (often noisy until the early hours of the morning), massage parlors, cheap tour operators and restaurants that cater to tourists. 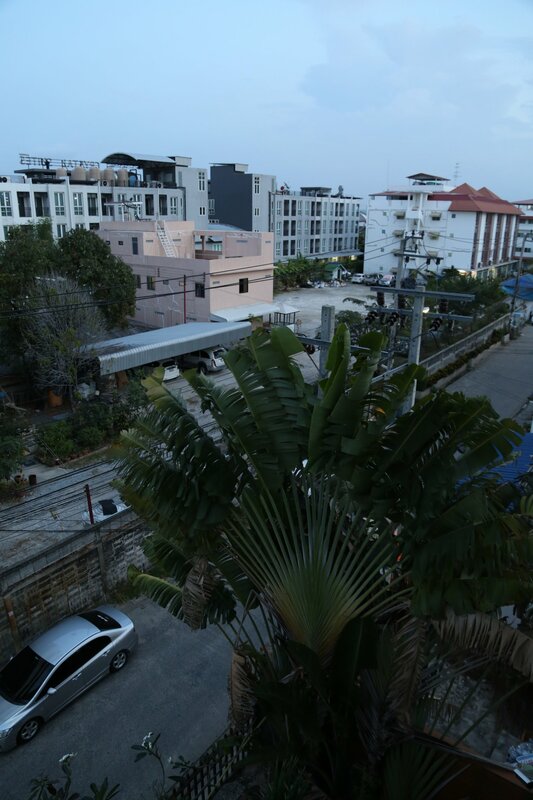 Also consider staying at nearby Rambutri Road area – mere minutes walking from Khao San Road. 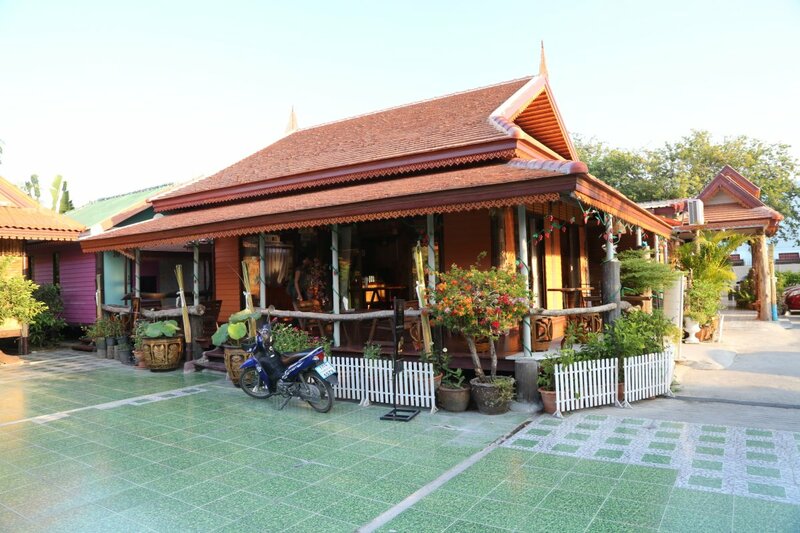 Rambutri provides all the same services as you will find on or near Khao San but its more quiet and relaxed. Rambutri is located just west of the end of Khao San Road towards the Chao Phraya River. And if you want an even more quiet and local experience – definitely look at staying in one of the guesthouses in the Samsen area – no high rises here – rather dominated by residential old school Bangkok neighborhoods and plenty of guesthouses. And remarkably it is only about a 10-12 minute walk from Khao San Road. Say NO to guesthouses that do NOT serve Thai people. 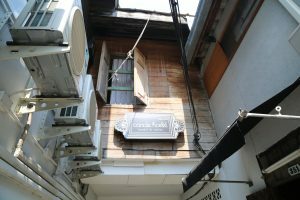 Some guesthouses in and around Khao San Road, including the Rambutri district either advertise blatantly that they do not service Thai people or if you are with a Thai person they will refuse that person entry to their guesthouse. 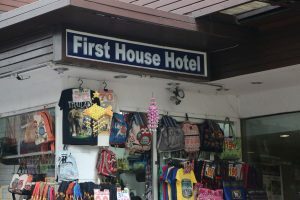 Always ask your guesthouse if they service Thai people. Two guesthouses to stay away from are Bella Bella and the Sawasdee Inn – both located on Rambutri Road. 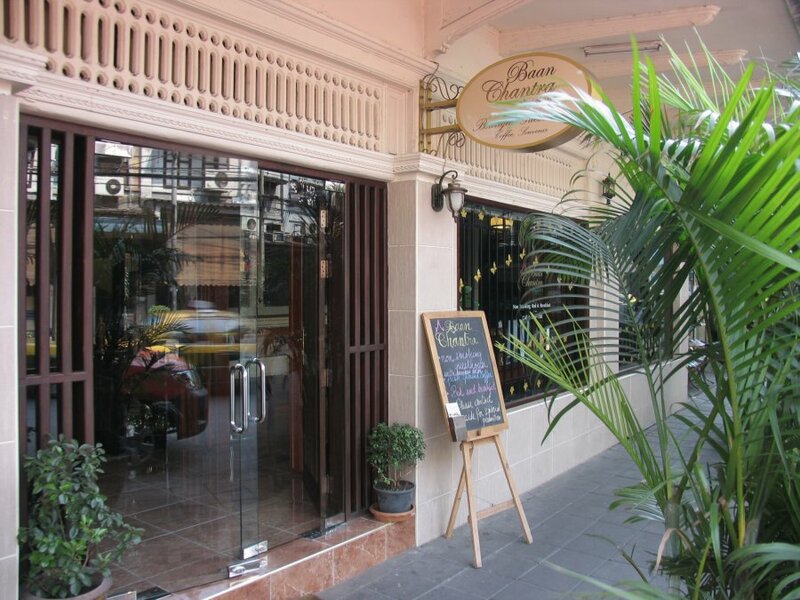 Baan Chantra is located at 120/1 Samsen Road about a 10 minute walk from Khao San Road. This is a privately owned upscale small guesthouse located in a renovated historical home that dates back to 1936. 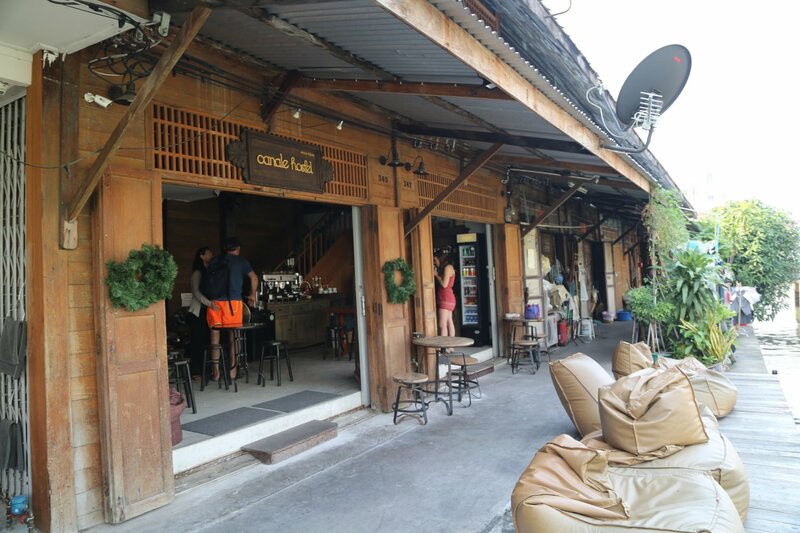 Canale Hostel is located in the Khao San Road / Samsen District but feels anything like being on Khao San Road despite only being a less-then 10 minute walk away. 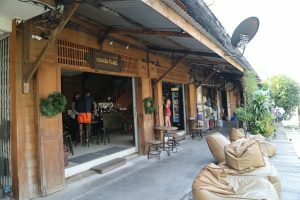 Appropriately named this unique hostel sits on the edge of a small canal that connects directly to the Chao Praya River. It is quiet here which one cannot usually find on or near Khao San Road. 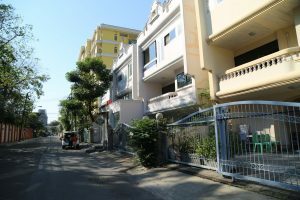 An area of town that is not yet developed to high rise condos and contains a number of local neighborhoods among them sprinkled a wide variety of budget and backpacker hostels and small guesthouses. Canale Hostel is located in an old wooden home that was originally built in 1945 and has since been renovated to accommodate both a dorm room and private rooms – while still keeping the traditional materials (wood paneling and floor boards). 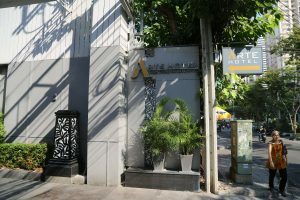 Those staying here access the property through a narrow soi that is definitely not your normal entrance to a guest house in busy Bangkok – passing by several small homes. In the evening or morning – best chill spots are outside on the wooden deck in one of their comfy solo lounges overlooking the canal. 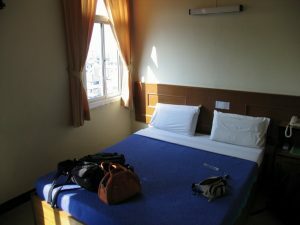 The dorm rooms tend to be very cost effective for budget travelers who are looking for stay that is unique and a bit off the beaten path. 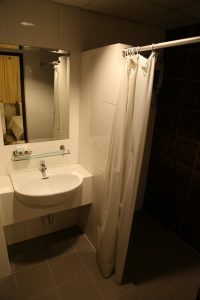 Their single rooms tend to be somewhat pricey but if you are traveling with 2 to 4 people and you split the cost – its not as bad as a single person paying for one of these private rooms. 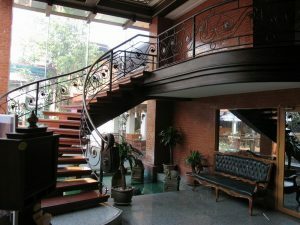 D&D Inn , is one of the nicer hotels located smack in the middle of Khao San Road – rates are very reasonable for the type of lodging you receive. Rates run from about 400 to 750 baht per night depending of course on Single or Double room or AC or fan room only. 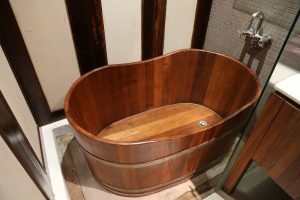 A very nice hotel – they have a pool and sun bathing deck located on top, nice interior and courtyard – some rooms are a bit noisy so ask for their quiet ones. 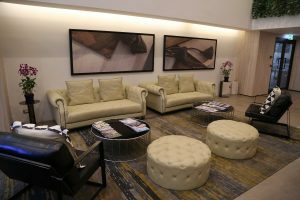 There is a full service spa and salon (Hello Spa) on the 7th floor. Their motto is “quality on a budget”! Look for discount coupons to this spa/salon located on the first floor. Ibis Styles formerly Viengtai Hotel is located at 42 Tanee Road, Banglampu in Bangkok is well worth the price. Part of the Accor hotel brand, it is one of a number of hotels located within the old city of Bangkok. 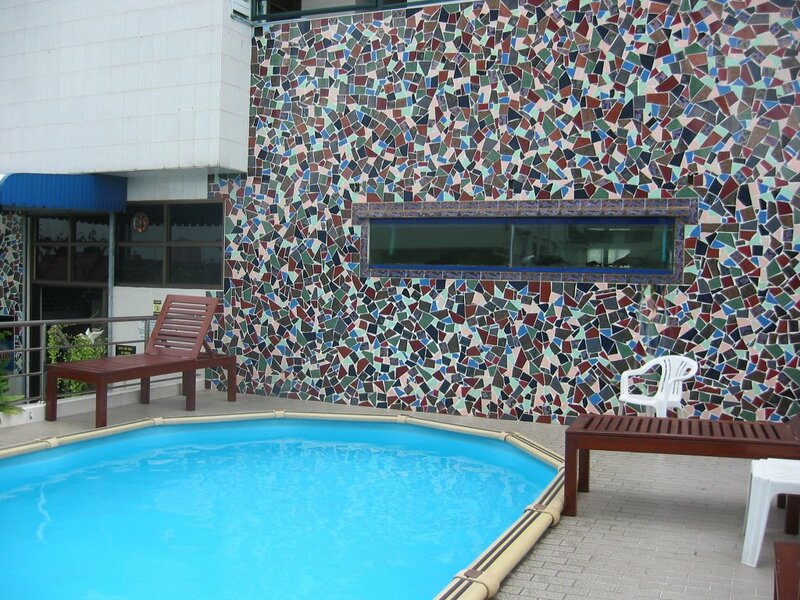 Features a 24-hour restaurant, comfortable rooms and a large swimming pool. The buffet all you can eat breakfast is included with the cost. This breakfast is actually very good as they have a very large selection of entries, fruit, salads and drinks. 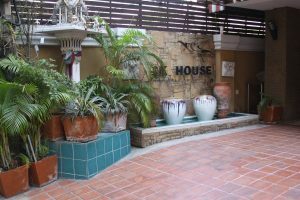 This hotel draws an eclectic mix of upscale back packers as well as families and typical tourists. There are plenty of restaurants nearby. 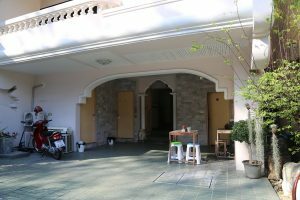 Phranakorn Nornlen – is located about 1 kilometer from the Chao Phraya River and about the same distance from Khao San Road – rooms run from about 1500 baht per night. You can walk to either the river or Khao San area but expect at least a 20-30 min walk to either place. 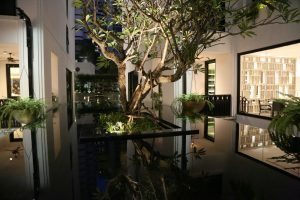 This is a unique one of a kind boutique hotel run by a famous Thai actress who is in her early 30’s. She is often at this hotel during the evenings. One of the friendliest staff you will find. Rooms are all different in their own way. 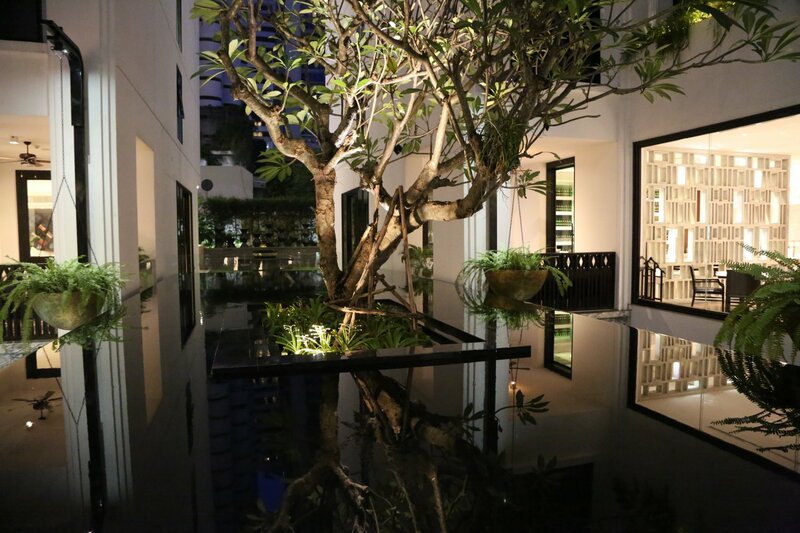 Their peaceful courtyard truly provides a serene escape from the hustle and bustle of most of Bangkok. Breakfast included with each stay – Thai or American food. 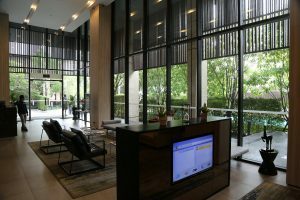 Wireless Internet is available for use with hotel stay – and several computers are available. Nice paintings and other artwork decorate this hotel. Some new rooms opened mid 2007. If you stay at Phranakorn Nornlen, consider using Trufflers “true flavour for travelers” run by Donald Woo Ming Lung – ask at the front desk. This is the only boutique travel host to specialize in ‘non touristy’ & ‘off the beaten path’ journey’s in Thailand – they work with guests of the Phranakorn Nornlen hotel to offer these one of a kind trips and tours. Suksawad Hotel . 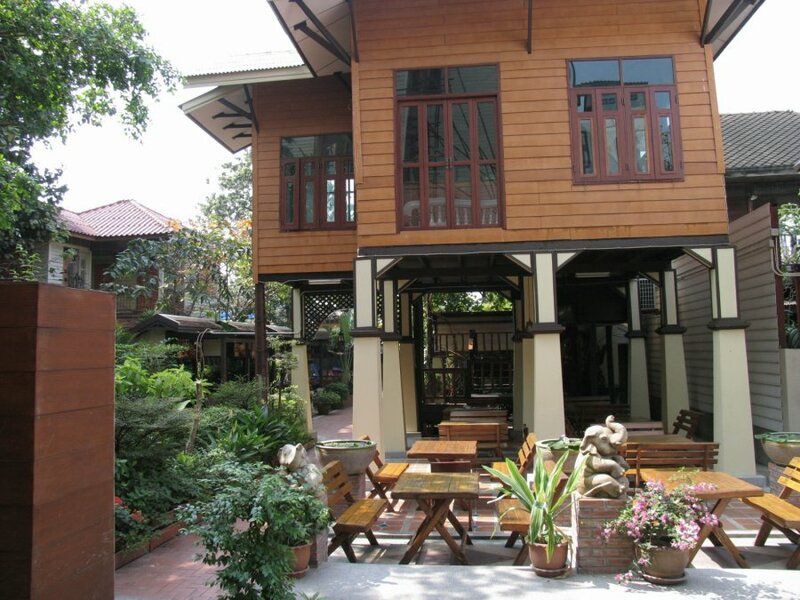 This hotel is about 1/2 kilometer from Khao San Road. 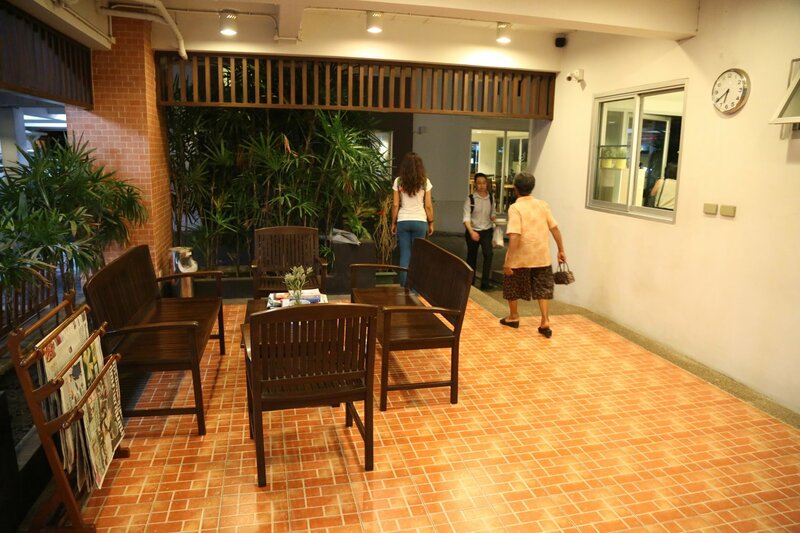 It is located at 8/3 Samsen Road and is also accessible during the day from Soi 6. 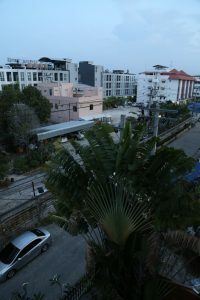 At night access is off of the main Samsen road as the entrance on the small Soi (Street) 6 closes. (Samsen Road runs right by Khao San Road). This is a cheap, clean, safe and very basic place to stay. Note some of the rooms are very well endowed with mirrors most likely catering to sensual activities. There are also several other nice guesthouses on this street (Soi 6). 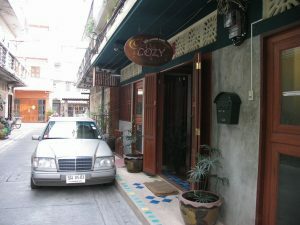 Thai Cozy House is another great deal. 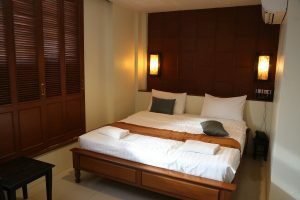 Located only a few minutes from Bangkok’s famed Khao San Road, prices for a single room (including breakfast) start at 550 baht/night. 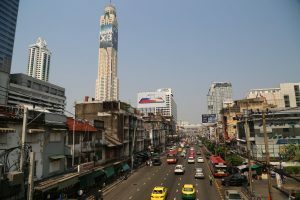 Silom is the heart of the financial district in Bangkok – and as a result sees less backpackers, is generally cleaner and quieter than some areas of Bangkok. 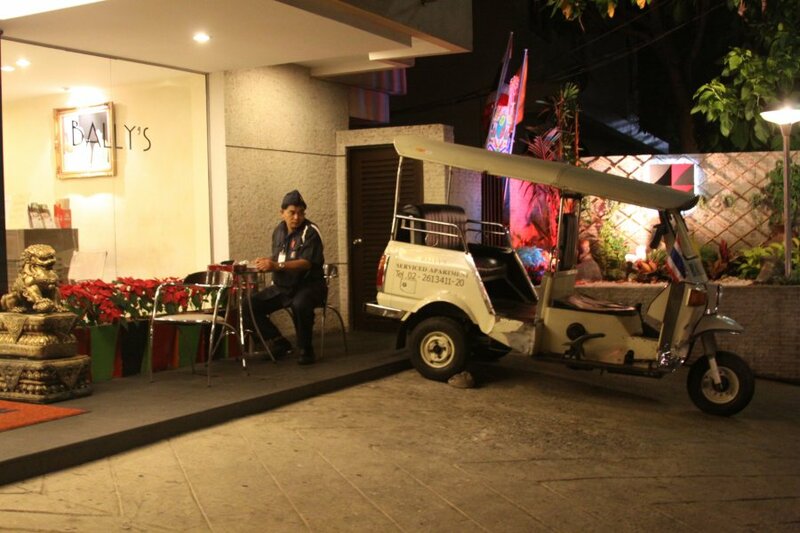 Note that much of the street food vendors close up shop when evening comes and your choice of food is often stand alone restaurants or taking transportation somewhere else. The Skytrain serves much of this area. 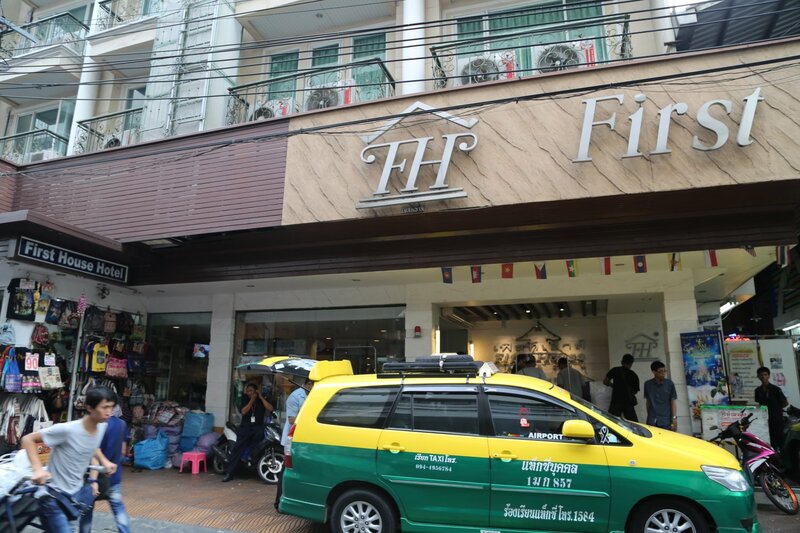 Heritage Sathorn – is located on a small soi (street) at 36 Soi Sathorn 13, Sathorn Tai Road about a 15 minute walk from the closest Skytrain stop of Surasak. The hotel has a large Tuk Tuk on site and advertises 24/7 free service. However in our experience, multiple times on different days we asked to be driven to the Surasak Skytrain stop (as they advertise) only to be told that they have no driver. The hotel has 9 stories, the rooms are large and nicely decorated and include a refrigerator as well as a balcony. There are several street food type vendors within minutes walking of the hotel but most close somewhat early in the evening. This is certainly not a touristy part of Bangkok to stay in. The staff is very friendly, helpful and bilingual between Thai and English. Hotel Ibis Bangkok Siam is located at 927 Rama 1 Road. Busy part of town with easy access to a number of Bangkok’s most popular shopping centers including MBK, Siam Paragon and Central World. Also several nearby temples and other cultural attractions within a short walk or drive from the hotel. Very easy access and nearby walk to the National Stadium skytrain stop. Features 189 contemporary Superior, Suite and Privilege rooms. Pet friendly. Modern and hip feel. 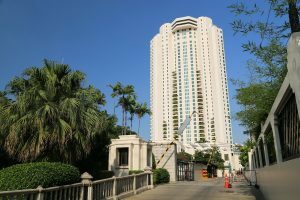 Lebua State Tower is a modern 64 story hotel – located fairly close to the Chong Nonsi or surasak Skytrain stops along the Silom Line. 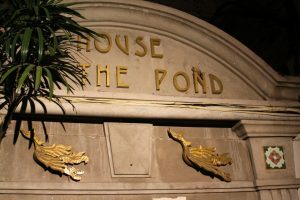 It was featured in the movies, Bangkok Dangerous starring Nicholas Cage and Hangover II. As a result a visit here is also popular with tourists. Prior to the Hangover movie one could visit this location with relative ease. Since the release of that movie the property has seen a significant increase in visitors. Today they maintain a number of staff that carefully directs visitors to the appropriate locations within the hotel. 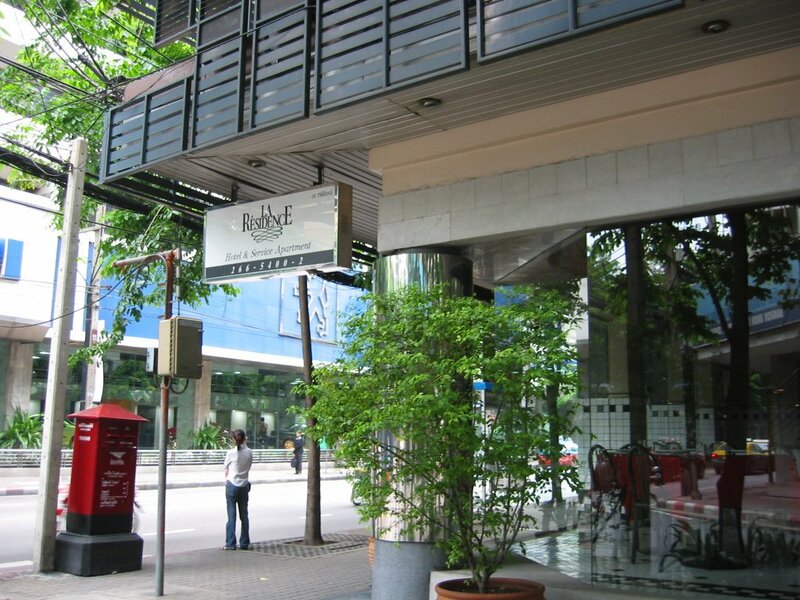 La Residence Hotel is located in the business section of Bangkok – within about 10 minutes walking distance to the Pat Pong night markets & risque entertainment, Jim Thompson’s House, and several shopping malls (173/8-9 Suriwongse Road -corner of Soi Anumanrajdhon 1). The hotel is located off of a busy street on a corner but the rooms are quite quiet. 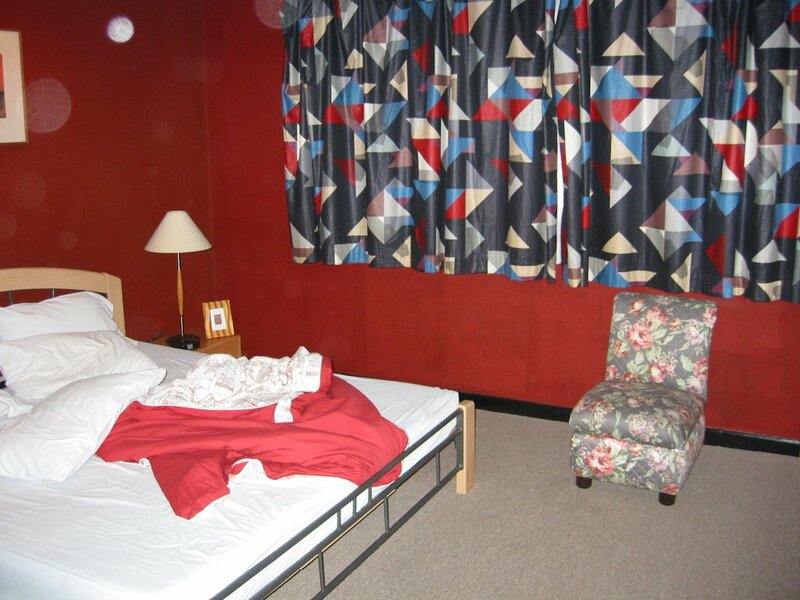 The cost for a double room runs about $40 US – this does include breakfast. Some rooms do not include breakfast. Be sure to review the enticing photos of their hotel and rooms on their website. If you walk by here at night it will almost look like this hotel is closed as their restaurant faces the busy street while the hotel entrance is off of the side street. 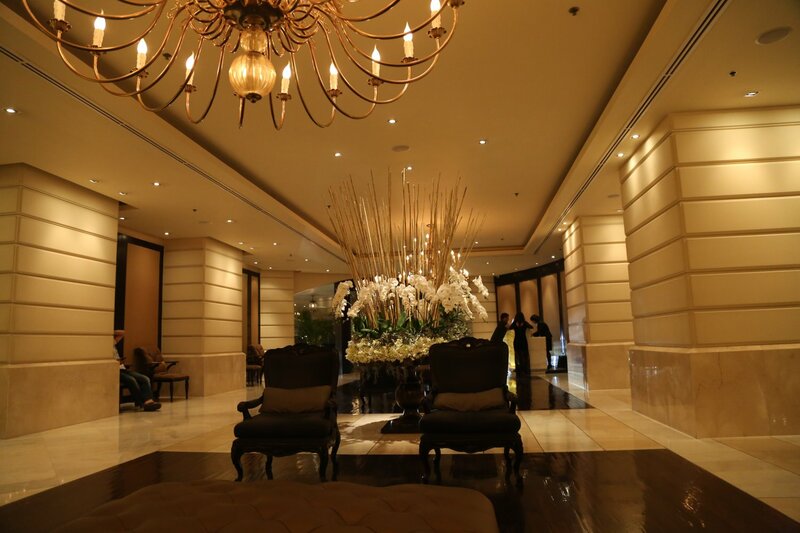 Click on the thumbnails to see the front of La Residence Hotel & the inside of a room. 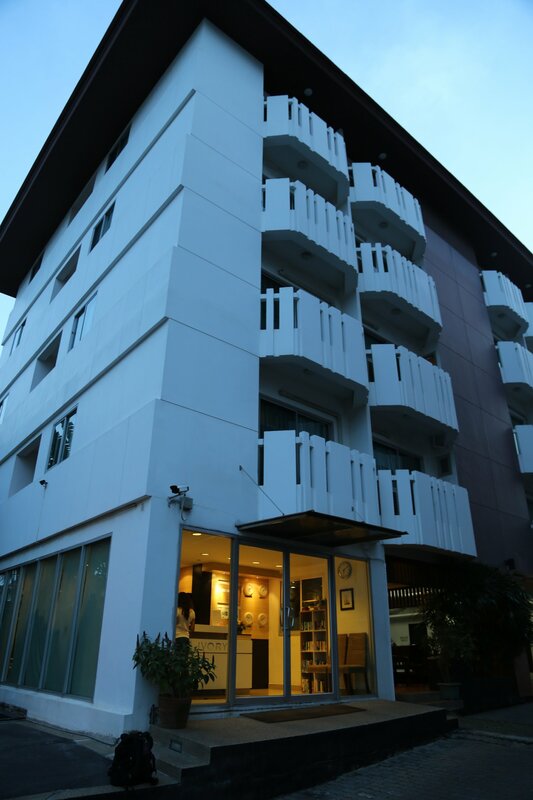 Lub D (meaning “a good place to sleep” in Thai) is a fairly new hostel located at 4 Decho Road in the Silom area. 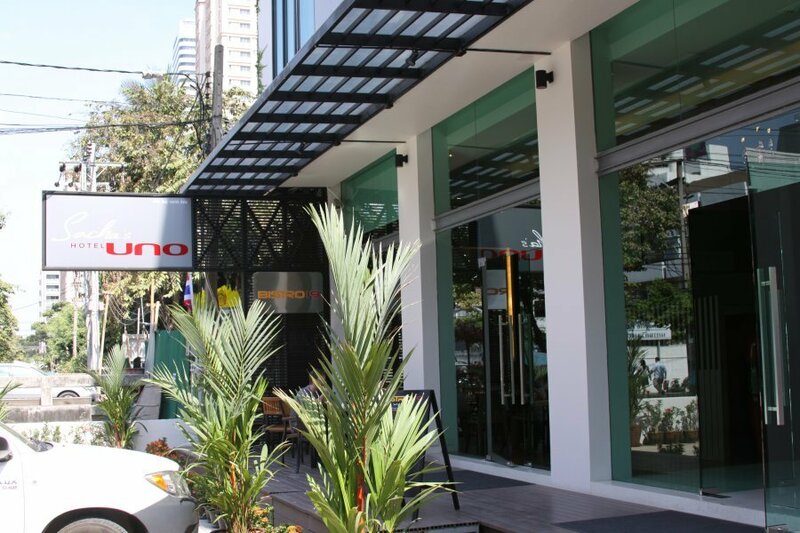 Decho is a small quiet road between Silom and Surawong Roads. Upscale meets budget in Bangkok and Lub D is the exciting result! The staff is very friendly, there is a “spaciousness” to this hostel that you don’t always find in hostels, the beds are way comfortable, there is the “cool factor”, but perhaps the most important reason of all for making a reservation is the community – which is an integral part of a stay here. 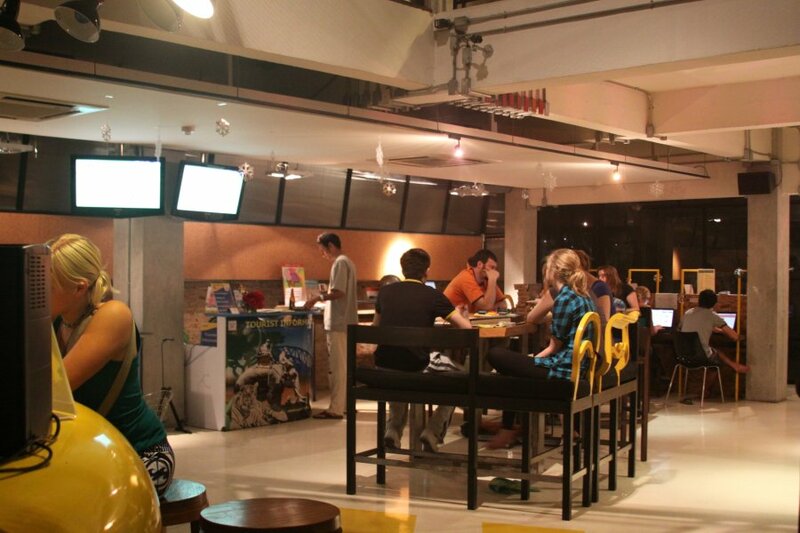 In the evenings it can be especially happenin’ downstairs next to the Yellow Donut Cafe & Bar. Nothing beats hanging out here at 10pm on a warm Bangkok night sipping a Bacardi Breezer and chilling with friends. 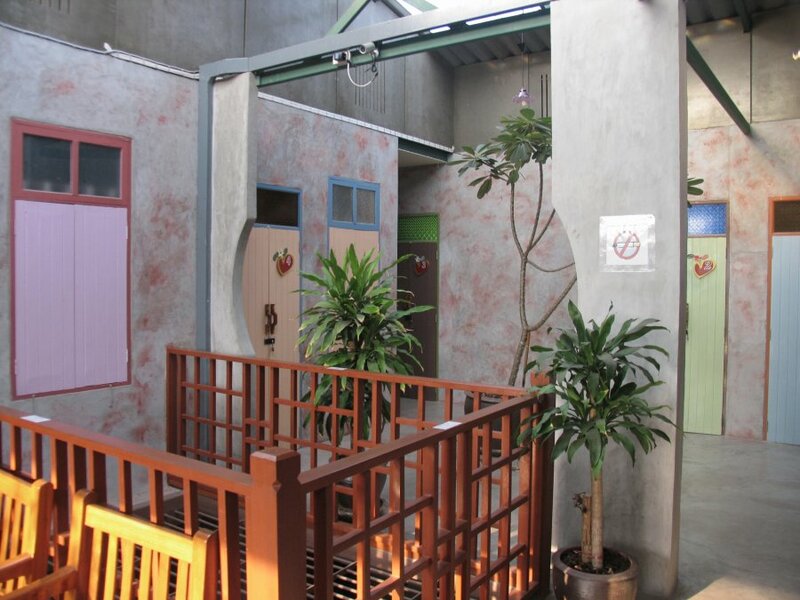 Several dormitories are available including a ladies only dorm. 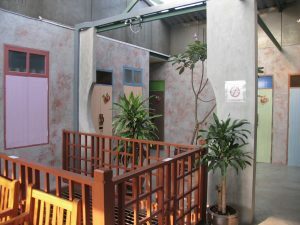 The dorms are geared to the International traveler who wants lots of activities, not just a place to sleep (note that they also have private rooms). As a result of the power of word of mouth, this it is a great place to meet travelers from all over the world. WiFi is available free throughout the building with several laptops available on the first floor. 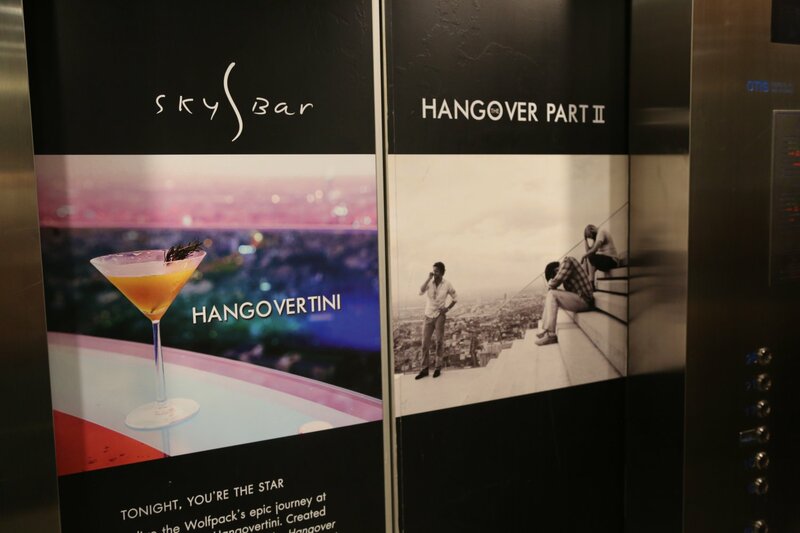 The closest Skytrain stop is Chong Nonsi (about a 8 minute walk) and the nightlife of the Patpong district is about a 10 minute walk away. A number of massage businesses are located nearby. If you are going to take a taxi, flag down a “rolling taxi” rather than those who wait around outside the hotel. They may alter their meters and or devise other ways to rip you off. 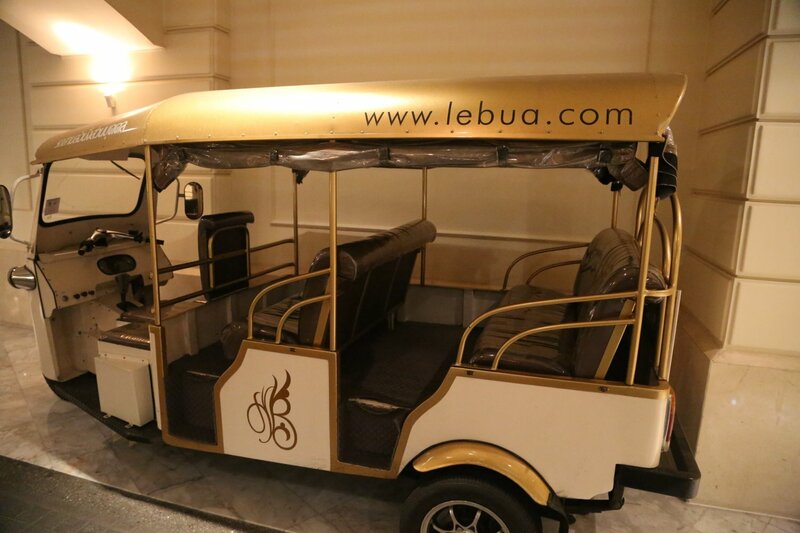 Lub D can also arrange tours and transportation needs through their travel counter located on the first floor. 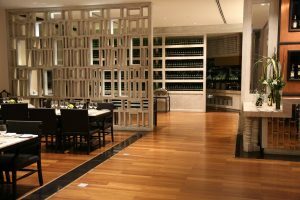 For more information visit: www.lubd.com For reference, they are located about a 5 minute walk from the Sofitel Silom Hotel. They currently operate one other Bangkok hostel, the Lub D Siam. 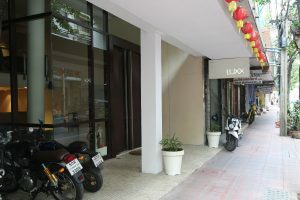 LUXX – maintains two properties in Bangkok, LUXX along Silom (13 rooms) and the Luxx XL on Langsuan Road (just north of Lumpini Park) with it’s 18 rooms. We stayed at LUXX. 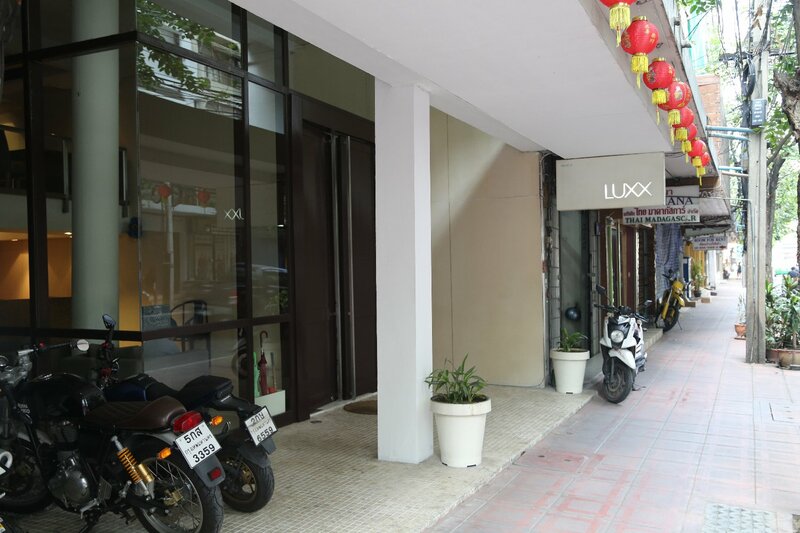 LUXX is located between a 7-10 minute walk from the closest Skytrain stop, Chong Nonsi. 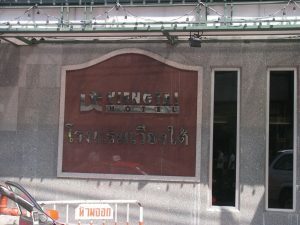 During busy hours, one can often wait several minutes crossing over the light at Silom on your way to or from this hotel. Good value for the price. 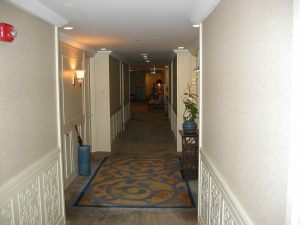 A darker feel to the interior – both the hallways and the rooms. Our room was much larger then expected with the bedroom seperated from the main living space via a sliding glass door. 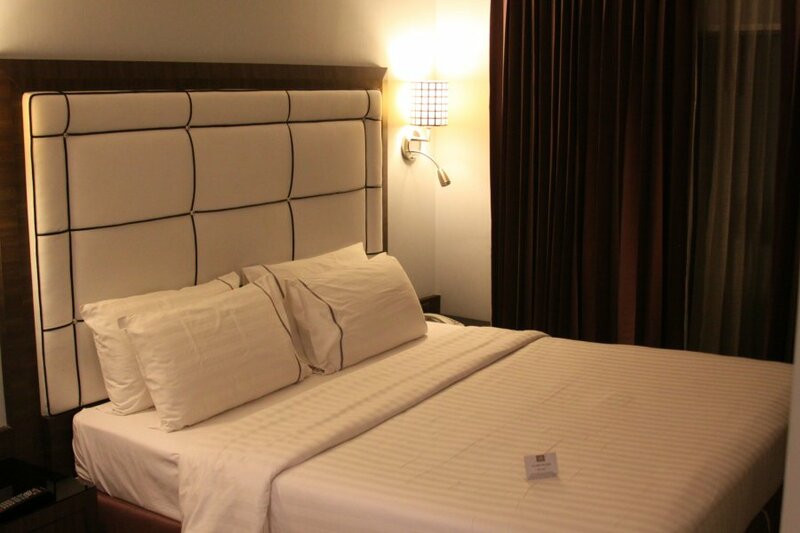 Sizable bed – firm, provided a very good nights sleep. 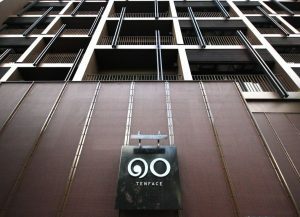 Tenface Hotel – see our “recommended hotel” review at top of this page. 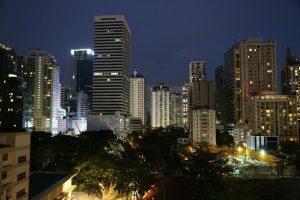 Sukhumvit is the heart of the hotel district in Bangkok. 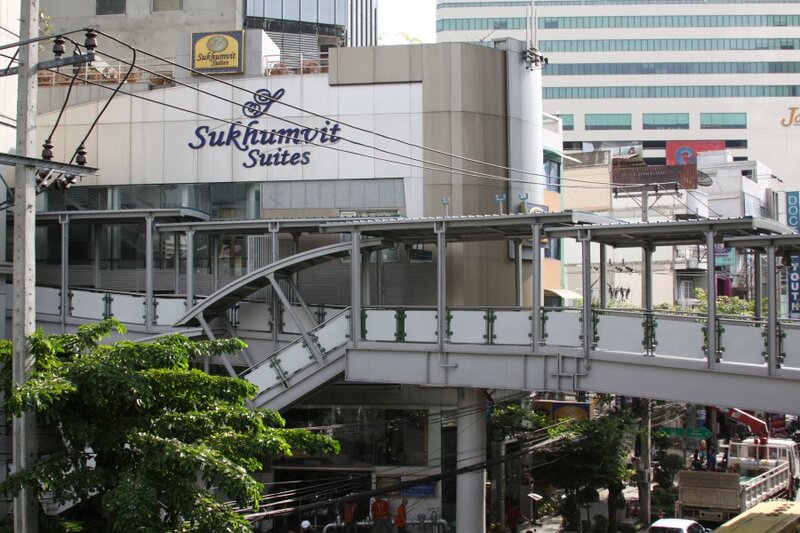 Many travelers stay here – many cheap and more luxurious hotels are merely walking distance from one of the Sukhumvit Skytrain stops. Lots of nightlife, massage parlors, restaurants, and street food. 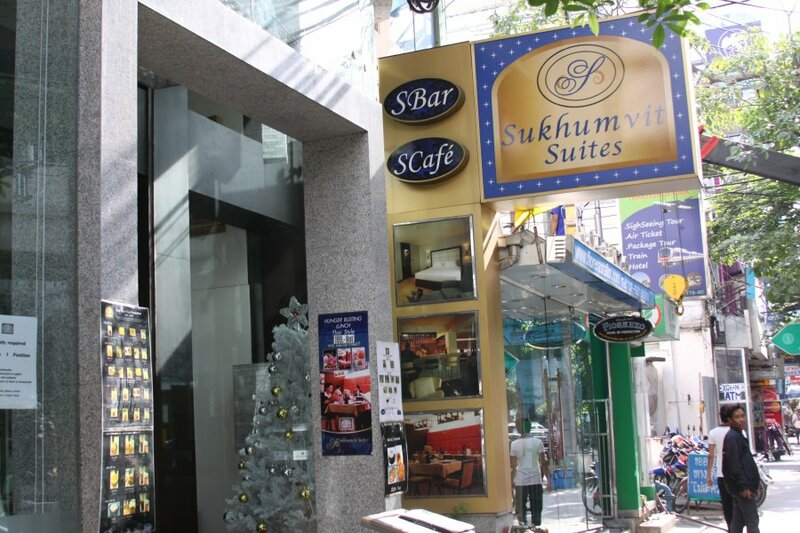 Sukhumvit itself is a super busy road with hotels situated next to it or on side streets (Soi’s). In general the the hotels become cheaper and you get more for your money the further away from Sukhumvit road. Arte Hotel is located at 29 Soi Sukhumvit 19 a short walk from the Sukhumvit metro and Asoke Skytrain stops. 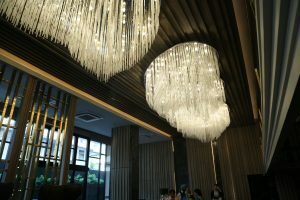 Located down a small soi/street – at the end of this street turn left to enter the lobby with its feel of faux luxury and large bling-based chandeliers lined ceiling of the lobby to check in. During a recent visit check in time was a bit slow despite plenty of staff behind the counter. Very friendly staff. The rooms are sizable, clean and come with a variety of toiletries. One of the major downsides of staying here is the walls between the rooms are apparently very thin and it is easy to hear your neighbors moving about or if they are talking loudly. Based on the room experience alone, this hotel is a bit over priced. 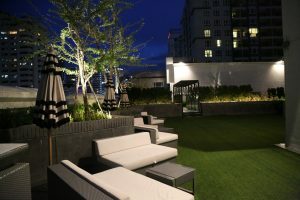 Two things in its favor however, are its location (although note you can find similar quality or better rooms for cheaper in this part of town) and the rooftop pool. 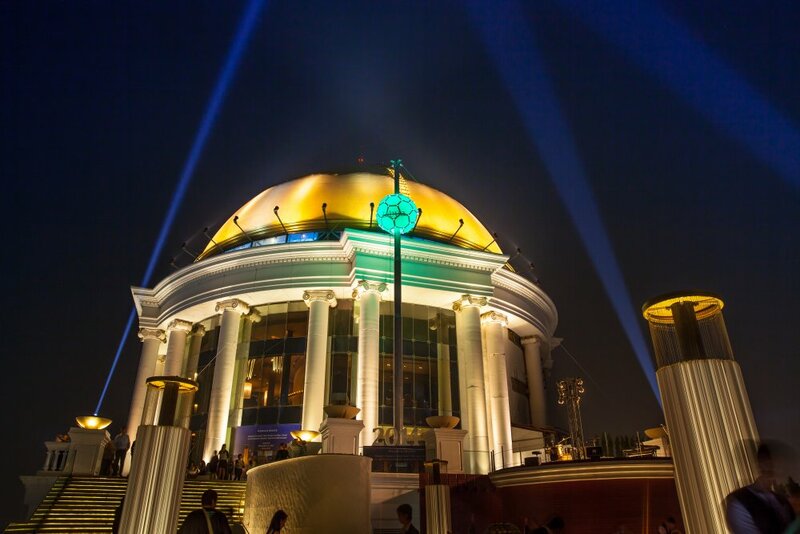 The rooftop, while not the highest of the buildings in the area affords one excellent views of the core part of Bangkok in all directions. The pool features cool water – with some of the seats actually sitting directly in the water. Two bars are located here – a larger indoor one and a smaller more basic one where along with ordering a variety of pricey drinks, visitors can also sign off for a towel. 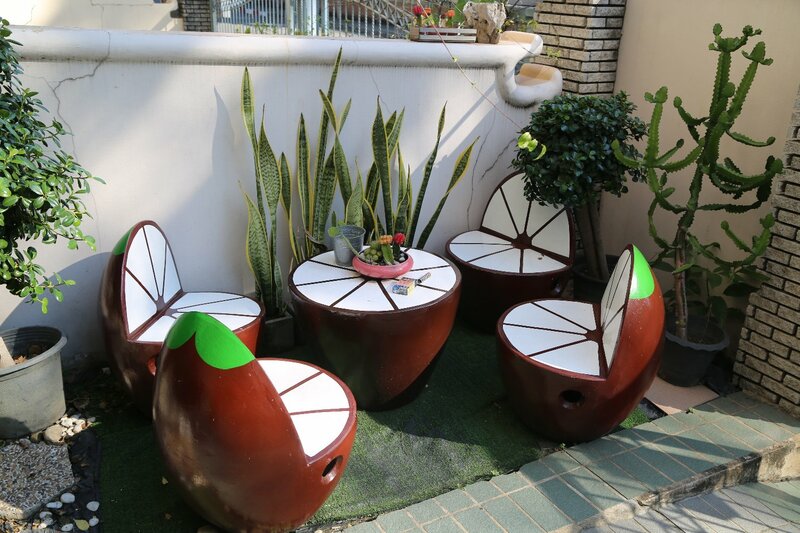 An excellent spot to hang out and enjoy the sunshine and meet other foreign visitors. Located on floor number 9. 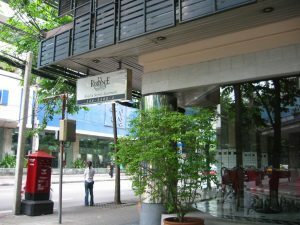 Dvaree Diva Bally Sukhumvit operates two hotels, one off of Silom and the one we stayed at – located all the way at the end of 172 Soi Sukhumvit 20. 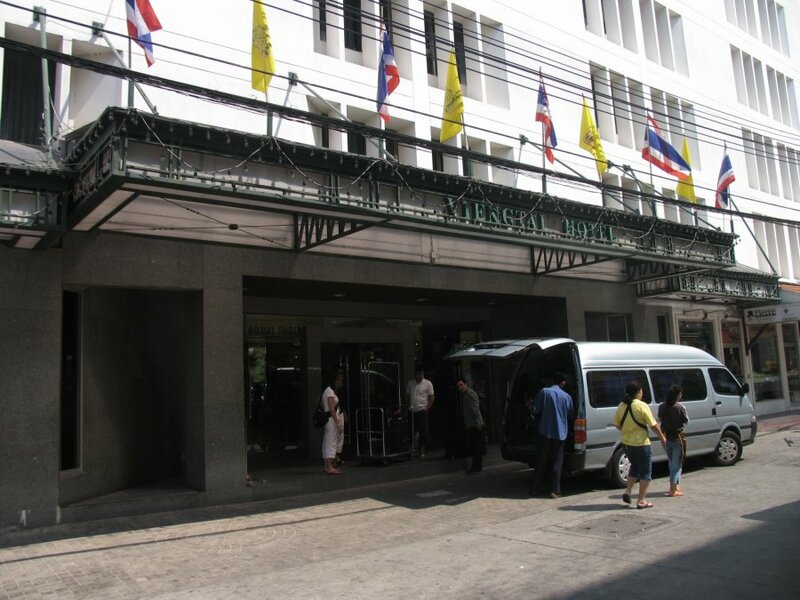 This hotel is about a 10 minute walk from the Asoke Skytrain stop. 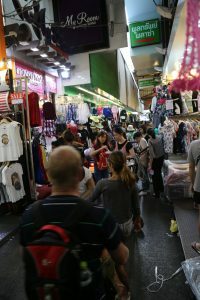 Lots of restaurants are located on this Soi as well as neighboring Soi 22 (both Soi’s connect in the back away from Sukhumvit). Dvaree Diva operates a free Tuk Tuk to give you rides back and forth (although this is does not operate before 9am and late in the night). 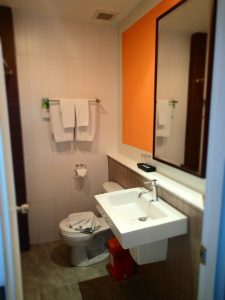 This is a modern hotel with clean comfortable studio or single rooms. The front desk attendants speak reasonable English. 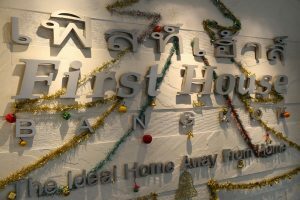 First House Hotel (NOT to be confused with another hotel located just down the street called The First House) is located about 1/2 kilometer from Sukhumvit Road. 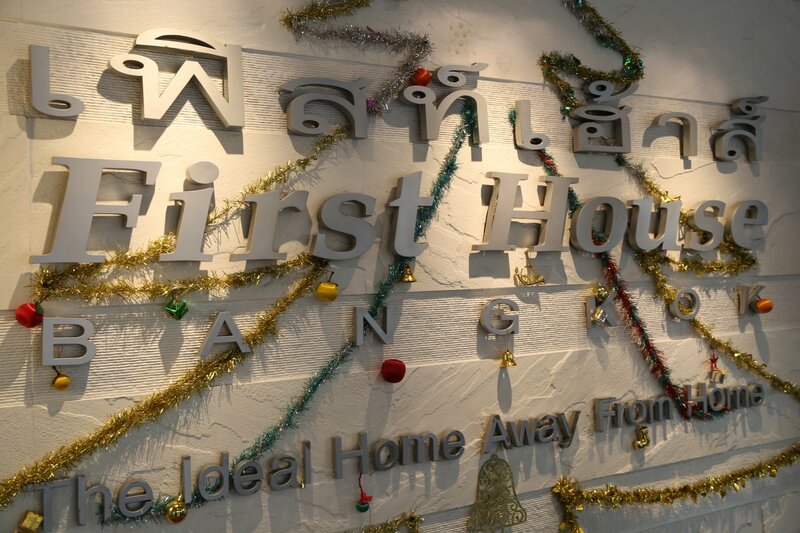 (14/20-29 Petchburi 19 Road, Soi Juldis, Phyathai District, Rajthevee). This hotel has sentimental value for Dave as he stayed here during his first trip to Bangkok in 96′. The Saranyuth Coffee Shop, located on the ground floor, serves meals that are quite tasty. Breakfast is included with each nights stay. Expect a buffet style breakfast with Thai food including some rice and vegetables, eggs, sausages (more like small hot dogs) and fresh fruit when in season (I’ve had delicious fresh watermelon, pineapple and guava at this restaurant). Be sure to take one of their “Town Guide” cards before you leave the hotel and put it in your pocket or wallet. These are small business sized cards that have the words “please take me to the above address” and a map prominently displayed on the front of the card. 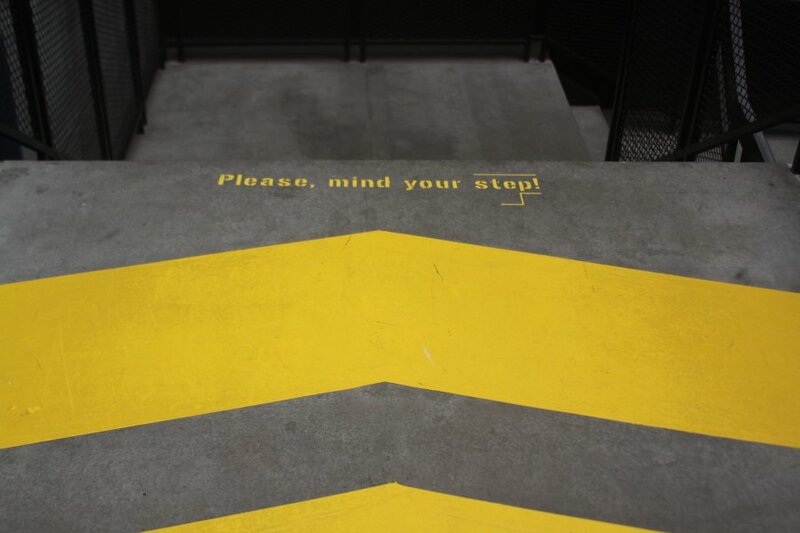 These are very helpful if you are not good with directions, especially in a foreign city! Newspapers in various languages are available in the lobby each morning. Galleria 10 Bangkok is located at 21 Sukhumvit Soi 10 and its easily within a very short walking distance of the main Sukhumvit Road and within a several minute walk of both Asoke and Nana Skytrain stops. The hotel is close to the center of all the action along this part of Sukhumvit yet is set a few minutes off the busiest part of Sukhumvit. The hotel has 188 rooms, a pool on the 8th floor and a rooftop restaurant. 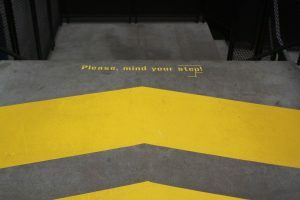 Be careful walking on the steps when you enter the main lobby – they aren’t lit up that well and there is water beneath part of them. 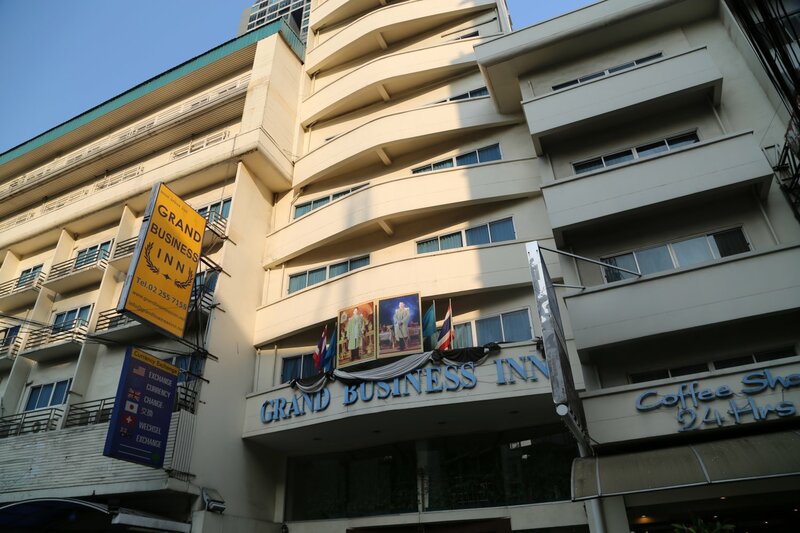 Grand Business Inn is located on Sukhumvit Soi 11 about a 1 minute walk in from the main Sukhumvit Road. This is a very convenient location to all the craziness of this particular area as well as to the Skytrain. 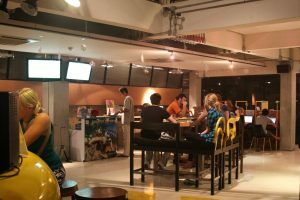 A coffee shop/restaurant (serves both Thai and Western dishes), is located on the ground floor and is open 24 hours a day. 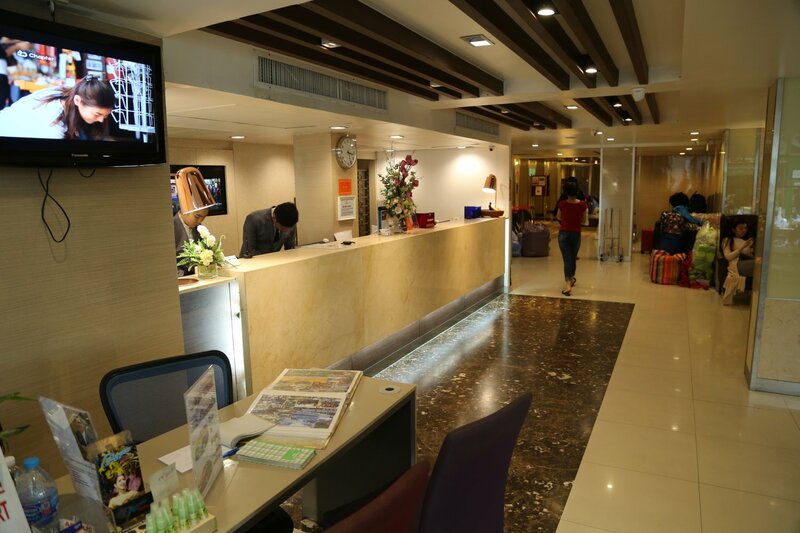 Business Hotel also has a travel agency on site to help with booking needs. 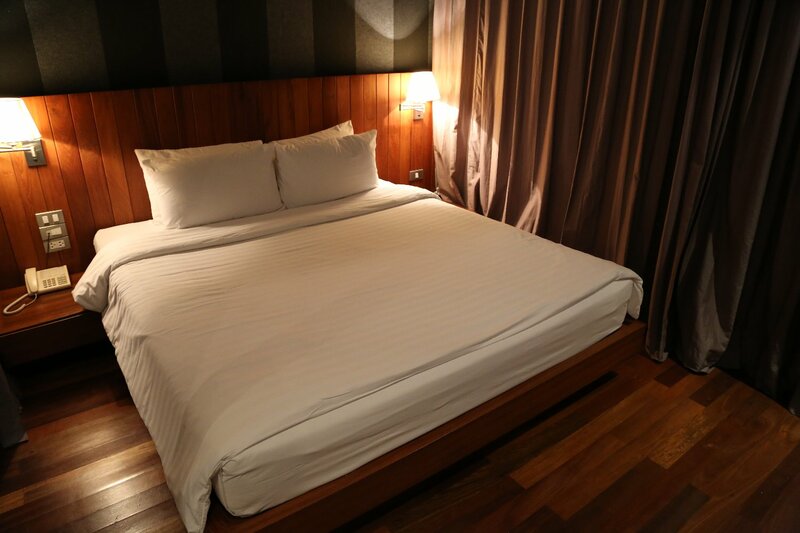 Hip Hotel is located 4 Metro stops from Sukhumvit Road (about 10-15 minutes on the metro). 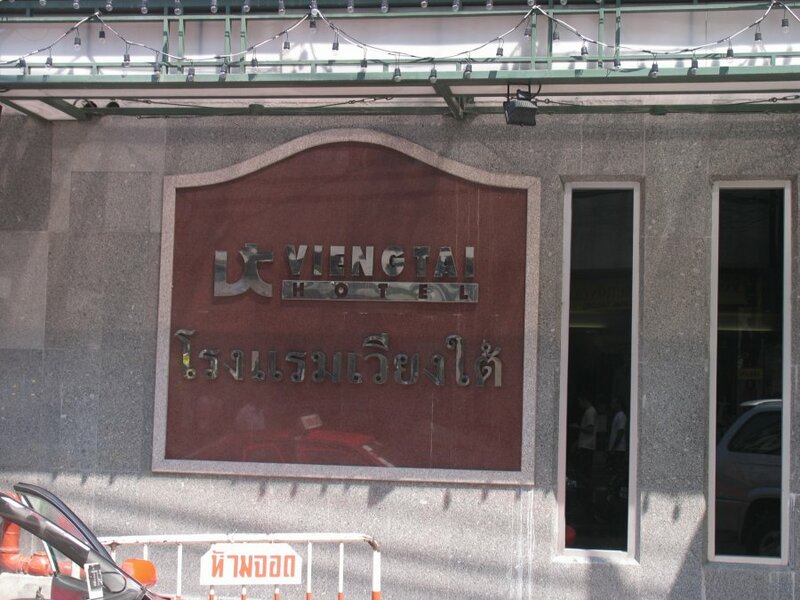 Hip Hotel is located along the small soi (street) that runs past the large Emerald Hotel. This hotel as advertised is “hip” with its judicious use of pink, purple and other shades of yellow. 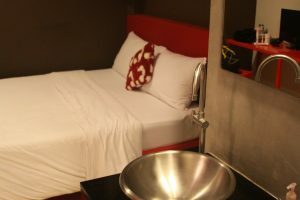 The rooms are stylish, very clean with big beds and large bathrooms including the tubs. Classic 80’s music is available on DVD along with a nice flatscreen TV with many channels. 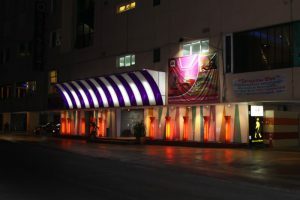 This area is one of Thailand’s lively nightlife districts and a number of massage with happy ending businesses are located nearby as well as “gentleman’s clubs”. Room massage is available by calling reception 24 hours a day and when we stayed here we saw several girls lined up in the lobby waiting for customers. With that said, the area is not seedy and neither is the hotel (very modern). 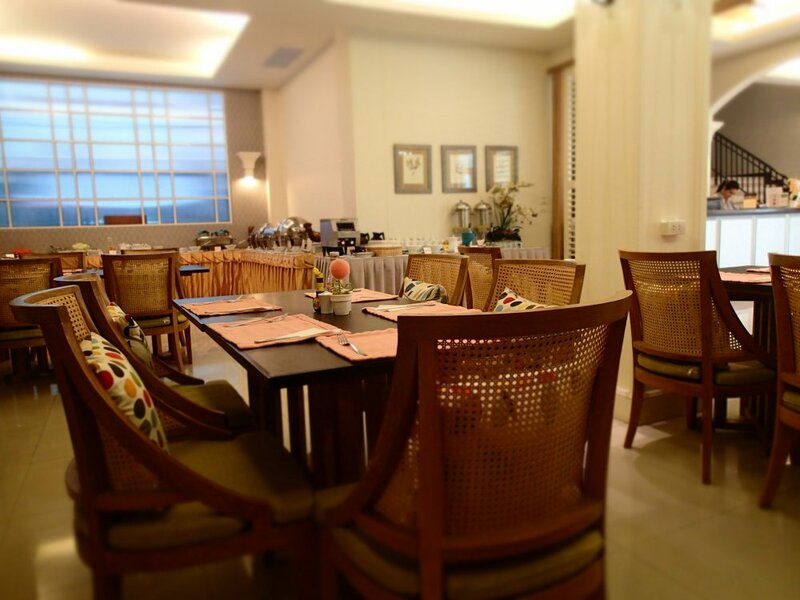 Breakfast is served (included with a stay) on the first floor and is buffet in style serving both western and Thai cuisine. 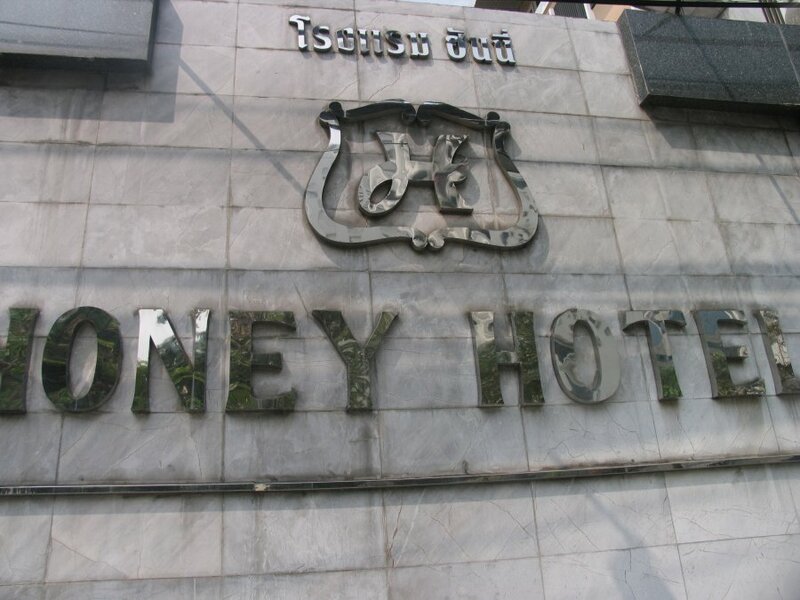 Honey Hotel is located at 31 Soi Sukhumvit 19. Their motto is “a place small enough to call home”. 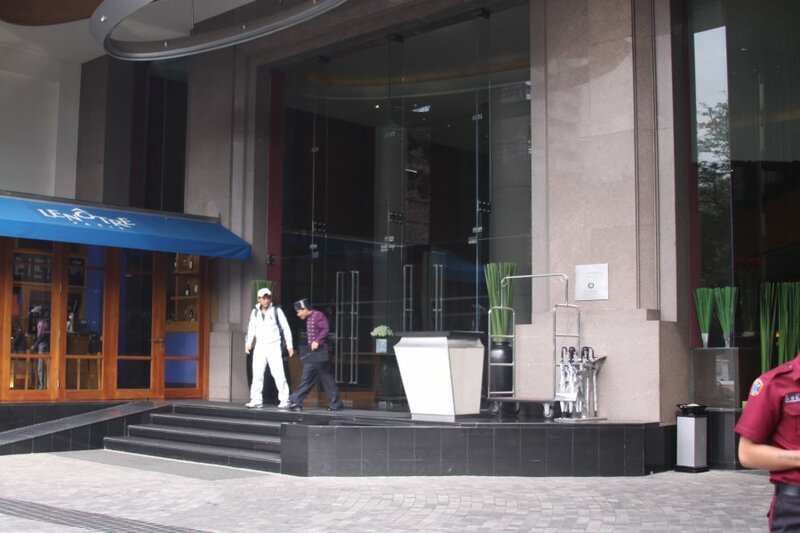 This is a very well established affordable hotel located within several minutes walking of the Asoke Skytrain stop. 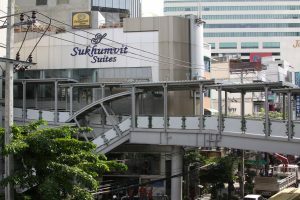 The Asoke Skytrain stop also connects to the Metro. This part of Sukhumvit has many hotels, most that you find online start around 1500 baht – this one starts around 800 baht. 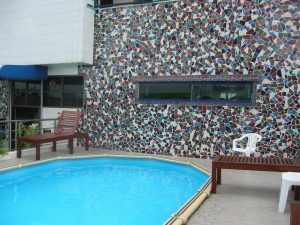 It is a multi-storied hotel with a swimming pool and restaurant next door. They have a limited number of under the building parking spots with the most affordable rooms on the first floor right next to the parking area. 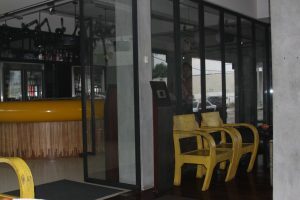 No Internet on site, but nearby cafes are available. The Robinson Department store is just down the street on your way to the Asoke Skytrain stop. 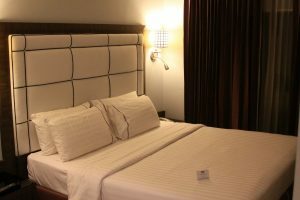 The rooms are clean and comfortable with good air conditioning. 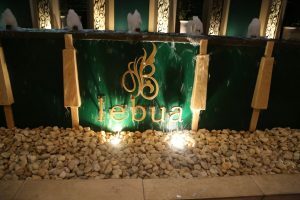 The staff is friendly and helpful and there is always someone at the desk who speaks a bit of English. They also have a nice small pool between the actual hotel and the small road. 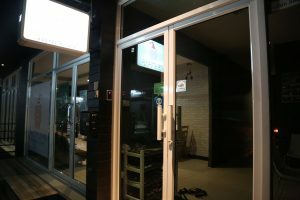 Little Pig Hostel is located about a 5-7 minute walk from the Ekkamai BTS Station and a few minutes longer then that from the Eastern Bus Station. Entrance when we arrived was locked and we had to wait for someone to come and let us in. Additional fees apply if check in is after 10pm. Annoying. No elevator found – if you have a lot of luggage you may want to reconsider staying here as a result. A small luggage storage room is located on the first floor next to the reception table. Rooms appear to be small – we stayed in a 3 bed room for 2 persons and still this room felt very small. Air conditioning took a while to cool down even in a room this small. 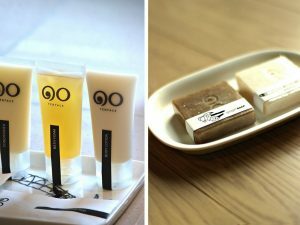 Only two tiny bottles of shampoo soap available in 3-person room. Room and the interior of this hostel were quite clean. wifi Internet on the 3rd floor was very intermittent. Mangosteen Guesthouse is owned and operated by a middle age/older couple – this tiny guesthouse is located about a 10 minute walk from the nearest Skytrain stop of Thong Lor. 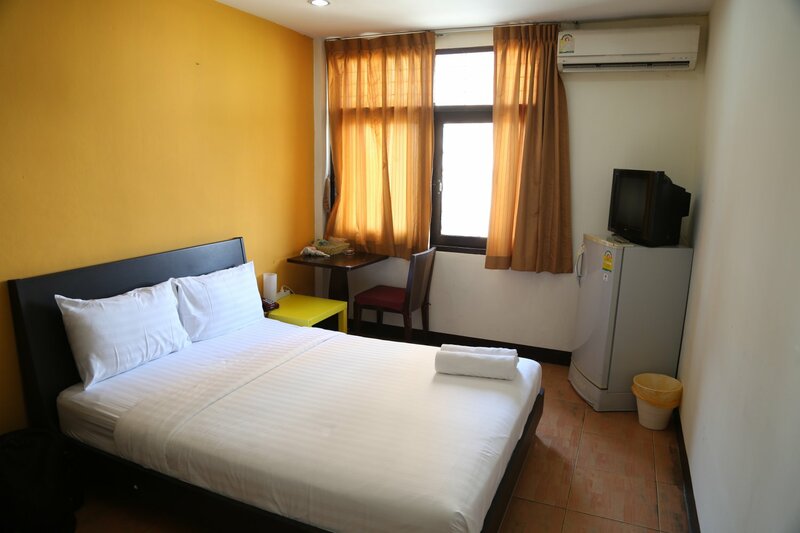 Located on a relatively quiet part of Sukhumvit Soi 38 – this makes a nice budget stay for those looking for some quiet but still within a short walk to the hustle and bustle of Suhkumvit. No prominent sign so use our photos here as a guide – and note that their location is correctly listed on Google Maps. Features several floors of rooms including two accessed from outside the main entrance (in the front courtyard area). 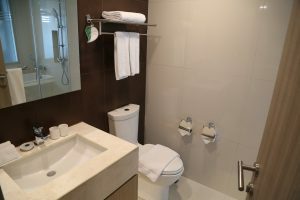 Rooms are extremely small – during a recent stay one had to access a shared bathroom located outside of the tiny private rooms. Soap and shampoo provided, housed in plastic containers hanging on the wall in the bathrooms. 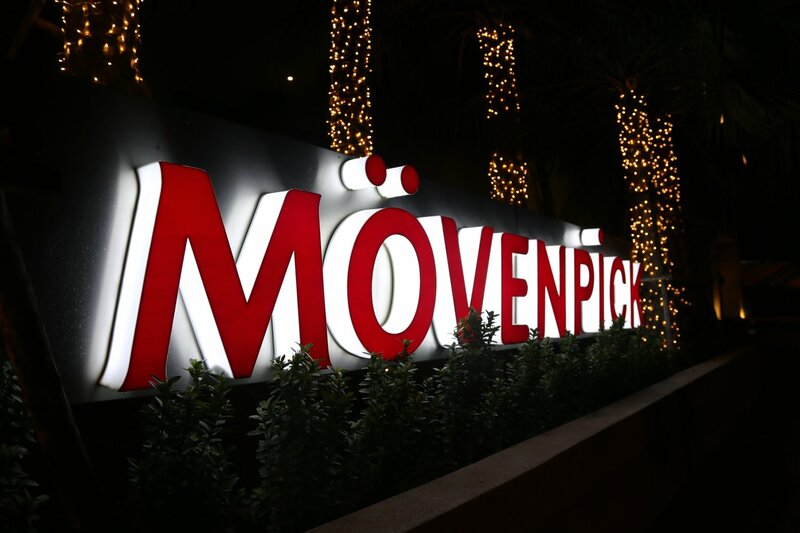 Movenpick Bangkok is located at 47 Sukhumvit 15, Sukhumvit Road. 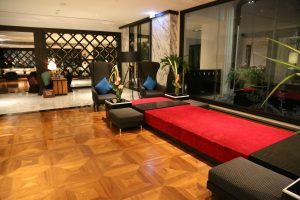 Luxury hotel featuring stylish rooms and suites. Excellent location within minute of shopping malls, nightlife and the endless stimulation that this part of Bangkok delivers. But this is a quiet respite when you need a break from the noise and lights of nearby Bangkok. 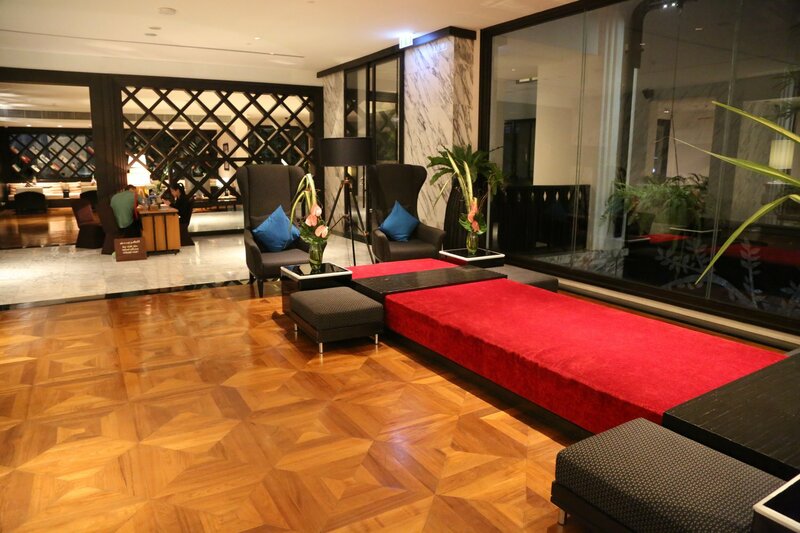 The hotel offers nearly 300 rooms – all equipped with WiFi. 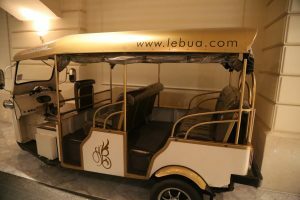 Because the hotel is located a slight distance off of Sukhumvit, Free Tuk Tuk transportation is to and from the hotel to the Asoke Skytrain stop. Walking this short distance takes several minutes. 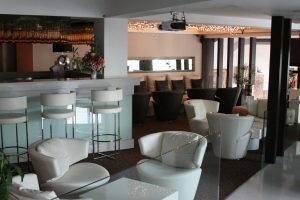 Beautiful roof top rainforest bar near the 20 meter long roof top pool. Also a fitness center on site. Excellent views of the city skyline from here especially at night. 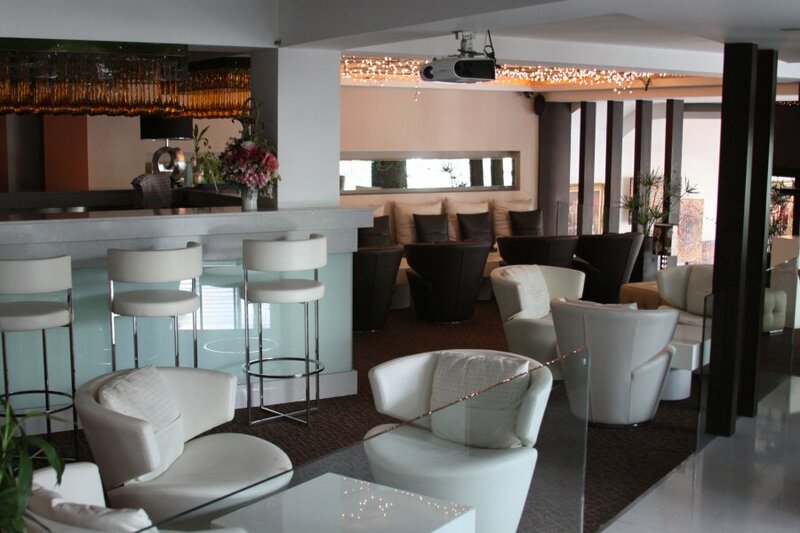 Delicious drinks – one can sit at the bar or hang out on one of nearby lounge chairs. 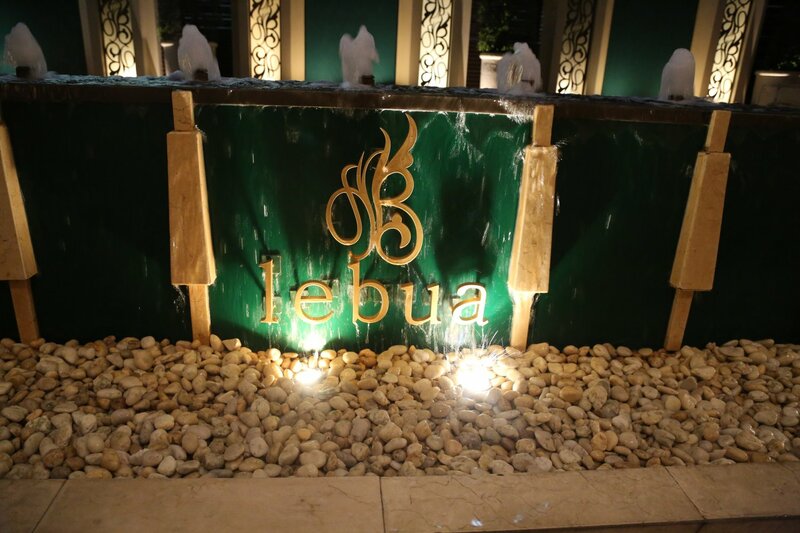 Check out the modern and elegant Lelawadee restaurant on the ground floor. On 8 The primary advantage of this hotel is is proximity to the Nana Skytrain stop and the action of this part of Sukhumvit road and its nightlife. 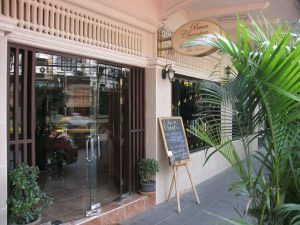 Their are two entrances; one through their restaurant directly on Sukhumvit and the other around the corner off a side street on Soi 8 (162 Sukhumvit Road). 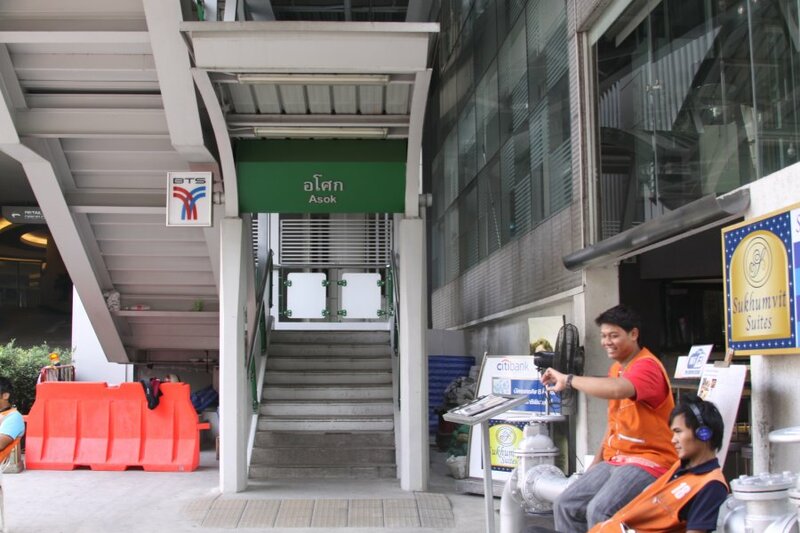 From the entrance on Sukhumvit, you are merely 10 seconds (yes we timed it) to the escalator leading up to the Nana Skytrain stop. Red Planet Asoke is located at 7 Sukumvit Soi 14 – about a 100 meter walk in from the main Sukhumvit Road. 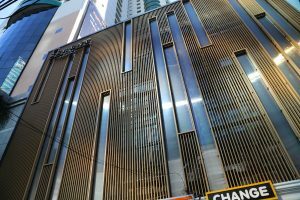 This is also about a 5 minute walk from the Asoke BTS Skytrain stop and is affordably priced for the quality and location – making this a good choice if you want to stay in this part of town. 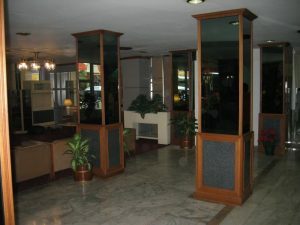 The hotel features a number of floors – small rooms which were very clean during recent stay here. Check-in is downstairs in a lobby with a color theme somewhat resembling the colors of Air Asia. A kiosk next to the check-in counter allows you to take a photo of yourself and then send it via email. A Tune clothing line is available and some of these are on display downstairs. 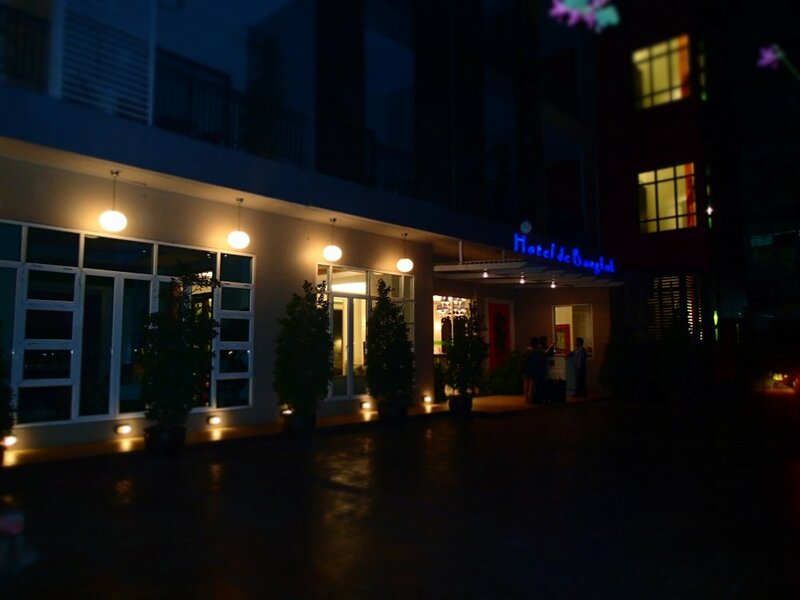 Royal Asia Lodge is conveniently located at 91 Sukhumvit Road, off of Soi 8 which is very close to the Nana Sky Train stop. Rooms with a King Size bed are available for about $25 a night. For hotels in this price range the Royal Asia Lodge is hard to beat. It is a family owned and operated; its location is on a street that sees very little traffic. 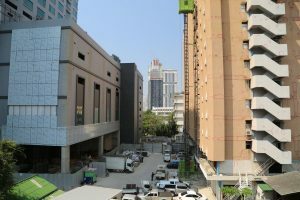 As you enter this street (Soi 8) from Sukhumvit Road, a small red button is available on the right hand side of the street – located on the back side of the first building (the side of the building that is parallel to the main Sukhumvit Road. Pressing this will bring free of charge, a Royal Asia Lodge Tuk-tuk driver who will drive you to the entrance to the hotel. 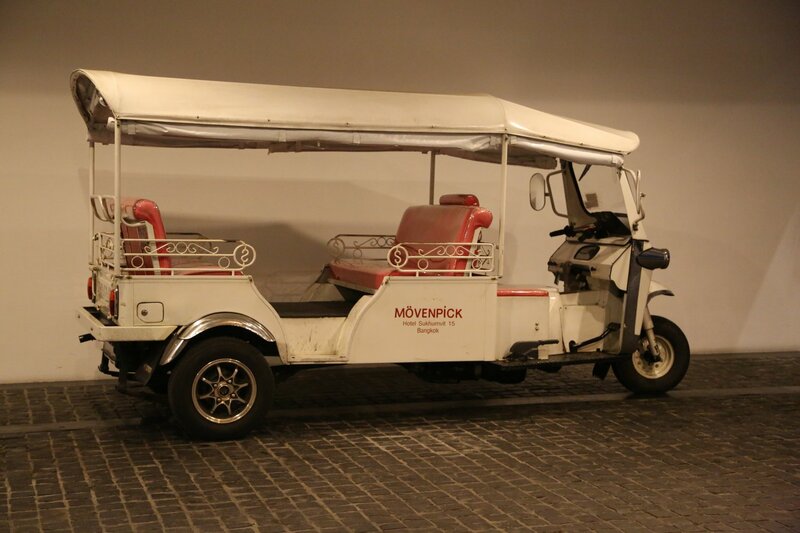 You don’t really want to walk this street to Royal Asia as its a considerable walk – the Tuk Tuk ride will only take a few minutes. You do not have to tip the driver for the ride unless you want to. 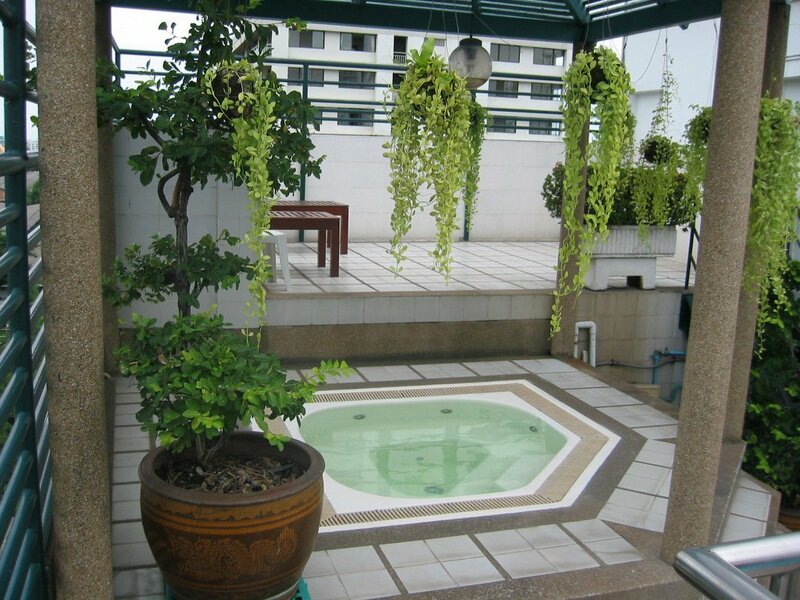 A nice, albeit small, pool is available on the rooftop (9 stories up) – you can swim, relax and watch the fish swimming in the long fish tank situated directly above the pool. There is also a nice Jacuzzi right next to the pool on the roof as well as great views of the city. Poolside service with the touch of a button is available for drinks or snacks. Single rooms are small, clean and comfortable. Refrigerators, TV’s and controls for lighting and AC are found in each room. Piped classical music is played in the elevator – and the elevator controls on each floor (outside the elevator) show you exactly what floor the elevator is on. High speed internet access is located downstairs – although its a bit pricey. 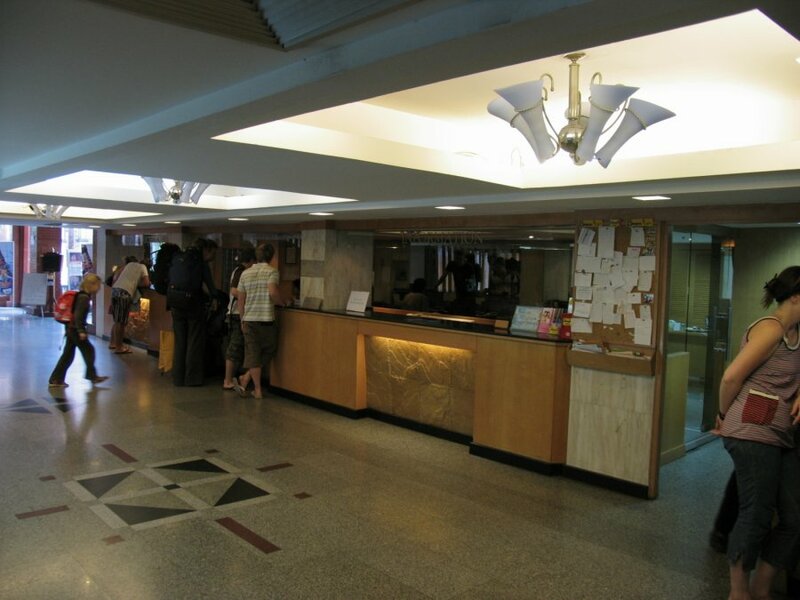 A tailor downstairs offers reduced rates on clothing for patrons of the Royal Asia Lodge. 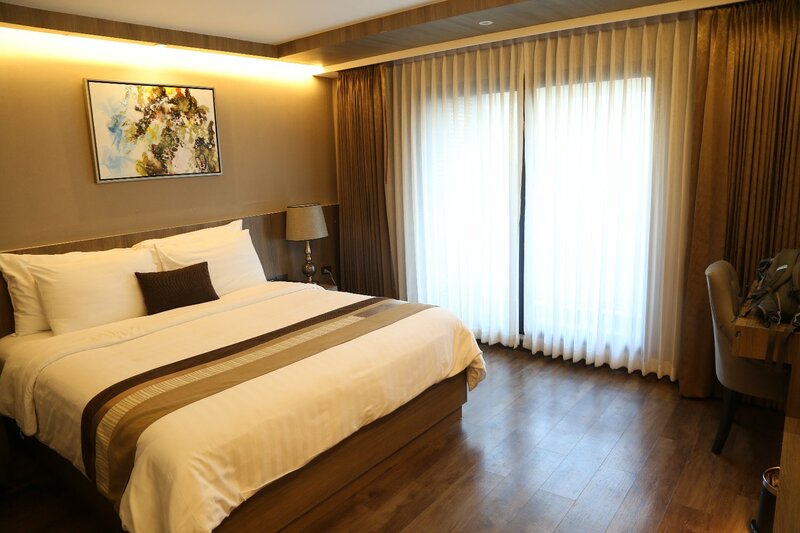 S Suites Sukhumvit – is in an ideal location, mere steps and seconds away from a stairway leading up to the Asoke Skytrain and the connection for the metro. You cannot beat this location! 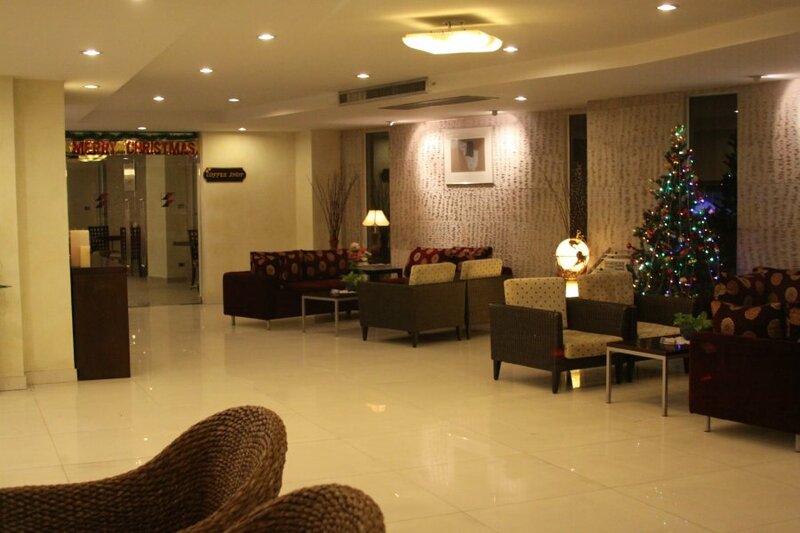 The staff is friendly and the rooms are very clean. Sometimes hotels have bland food – not so with this one. Authentic and tasty thai food is served for breakfast as well as western cuisine. Sacha’s Hotel Uno is a chic upscale boutique hotel located off of Sukhumvit Soi 19 – mere minutes from the Asoke Skytrain stop. This is a good choice for Business travelers. 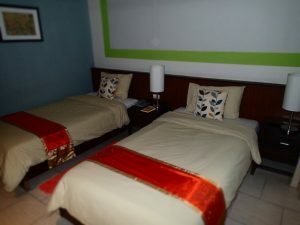 Large beds, tastefully decorated rooms, wireless Internet in all of the rooms. Also of note is the very nice cafe downstairs. The salads are excellent. The breakfast is average and slightly overpriced. 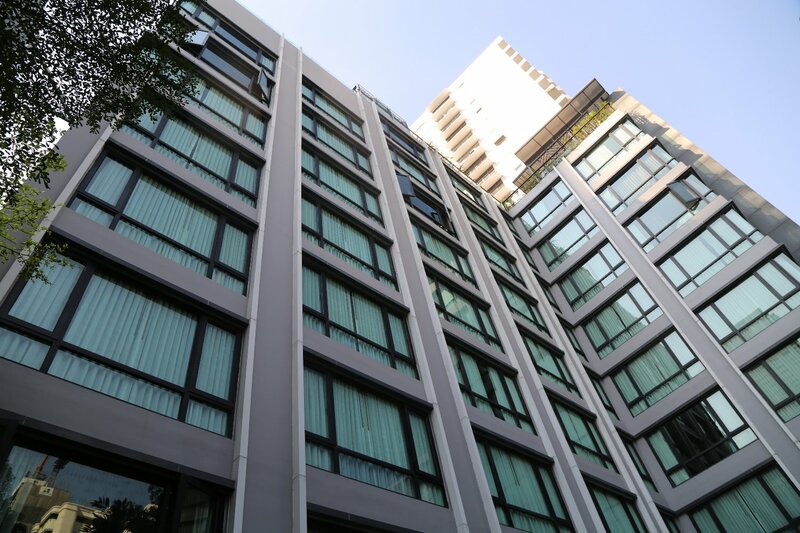 Serene Asoke Suites is a basic hotel with a great location. As you stumble back from the Asoke Metro station (the entrance is mere meters from the hotel lobby), stop at a bar for a stiff drink on the closest street, Soi Cowboy, relax with a massage 2 doors down from the hotel, hit the 7-11 next door for some basics and then voila and then a few meters next door, you are in the hotel lobby. Very friendly staff – like other hotels they will let you store your luggage here if you arrive before check in time for for a certain period after you check out. This hotel features one of the world’s slowest elevators – agonizingly slow – it can’t handle much weight or luggage either, rides are limited to two people. Rooms are sizable, clean with air conditioning that works well. Entry is via a keycard which you must keep in the slot to maintain electrical rights over your room. Wifi works very well and is very fast. 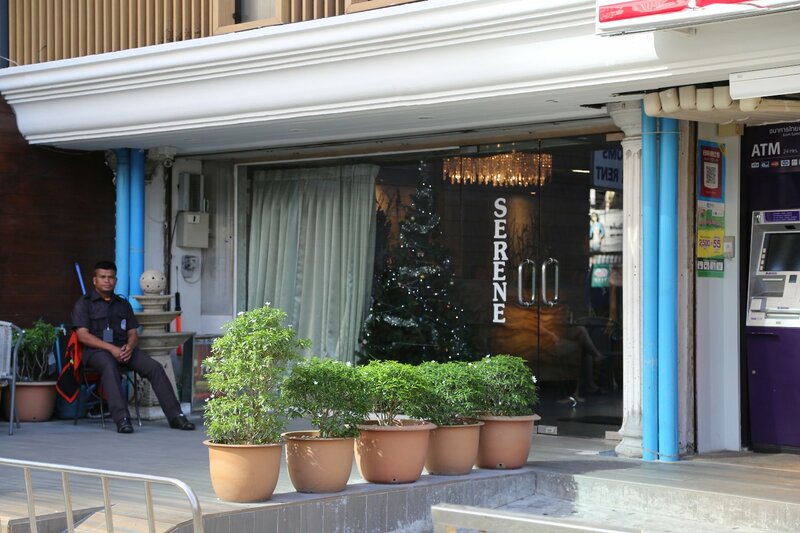 Because of its location to the sultry and sin status of the nearby Soi Cowboy, signs at the hotel forbid bringing ‘joiners’ up to your room – a euphemism for prostitutes. Somerset Ekamai Bangkok . This place is awesome! 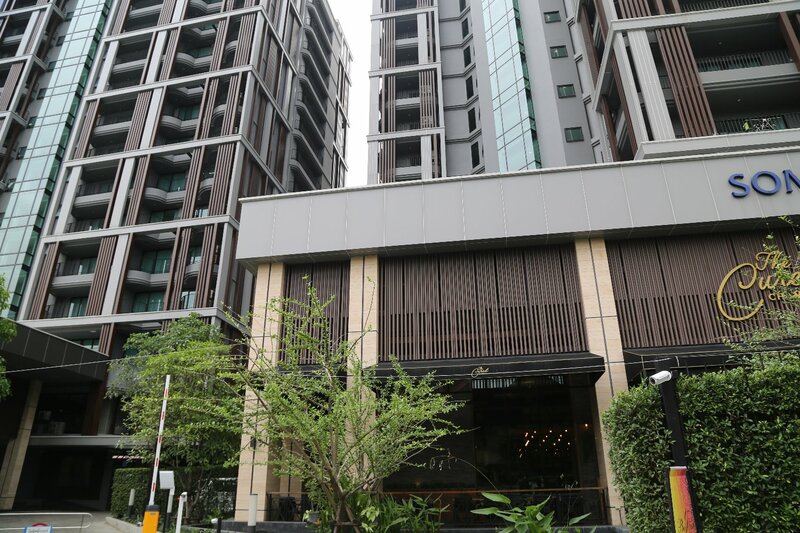 These serviced apartments (formerly a condominium space) are located about a 10 minute walk from the Ekamai Skytrain stop at 22/1 Ekamai Soi 2, Soi Sukhumvit 63. 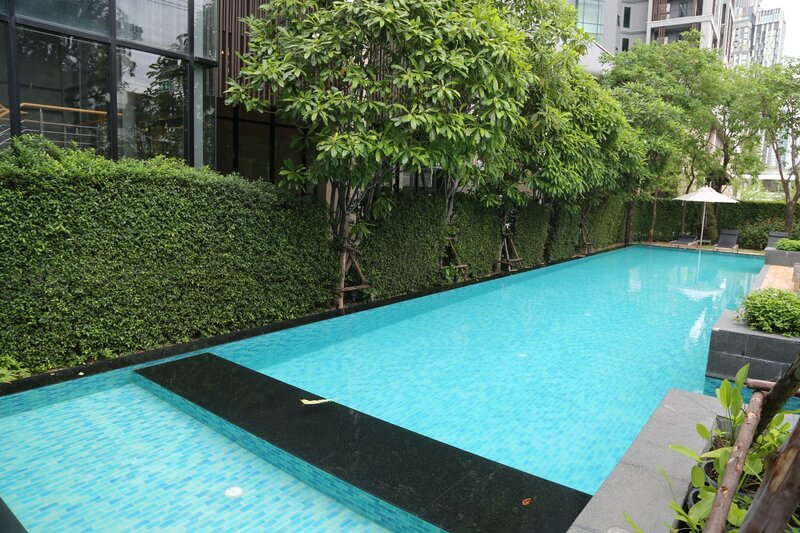 Because the location is well removed from the busy Sukhumvit – this is an ideal space for someone who likes quiet but within a short distance of the hustle and bustle of nearby Bangkok. Friendly and efficient staff. 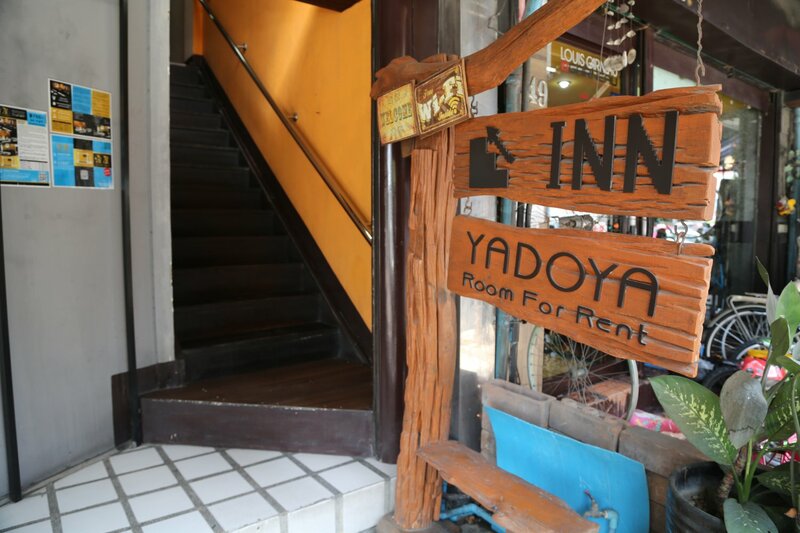 Yadoya@thonglor is conveniently located within only a several minute walk from the Thong Lor Skytrain stop (exit number 3). Somewhat of a pricy part of town to stay in, this apartment/guesthouse is somewhat of an anomaly with their rather affordable pricing. Older style building next to a number of newer and taller buildings. Great location – with easy access to restaurants (a number of Japanese restaurants) and very nearby massage places. Somewhat dated rooms – nothing fancy – very basic accommodation for budget travelers who desire a private stay. But the rooms are clean. No elevator so one will have to carry their luggage up possibly numerous floors. Front desk may or may not speak much English – staffed 24/7 even very late at night or early morning should you need to check out to make an airport run. Hot water works well – the room we stayed in had the sink outside of the bathroom. Comes with a decent sized refrigerator and provided bottles of water daily (even hung on your door in a bag each day should you put out your “dot not disturb sign”. Air conditioning works well. A pass card is provided to all guests (to open the front door which is always electronically locked next to the reception). Thirty rooms total. National Stadium There are prime shopping areas near the National Stadium and Siam Skytrain stops. Shopping includes the upscale Siam Paragon (finished in 2006) and the huge MBK Mall. This is a crowded area of town to stay in. Baiyoke Tower II is the tallest building (hotel) in the Kingdom of Thailand, although the new Ritz Carlton building will eclipse the Baiyoke Tower II’s height. This building is clearly identified by its circular shape. Sometimes organizations will hang their sign from the side of this building. It takes three different elevators to reach the top of this building. If you reach the 78th floor and you eat at the International Buffet restaurant you will find place mats that provide you with statistics such as: the pilings under the building run into the ground to the height of 22 stories, there are 1,740 windows in the building, it is 309 meters tall, there are 2,60 steps from the bottom to the top, which will take most people over an hour to climb, and the observation deck rotates a full 360 degrees. 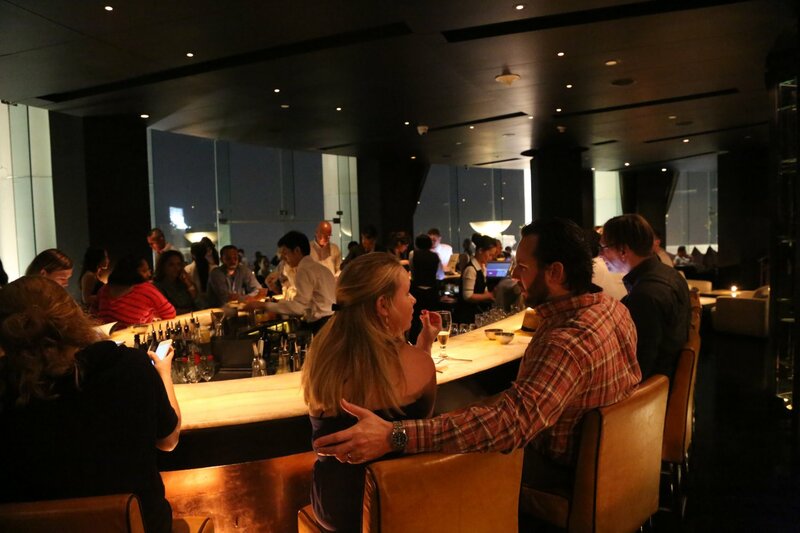 The International Buffet located on the 76th and 78th floors is worth the price for the surrounding experience & atmosphere of being in the highest restaurant and tallest building in all of Thailand. 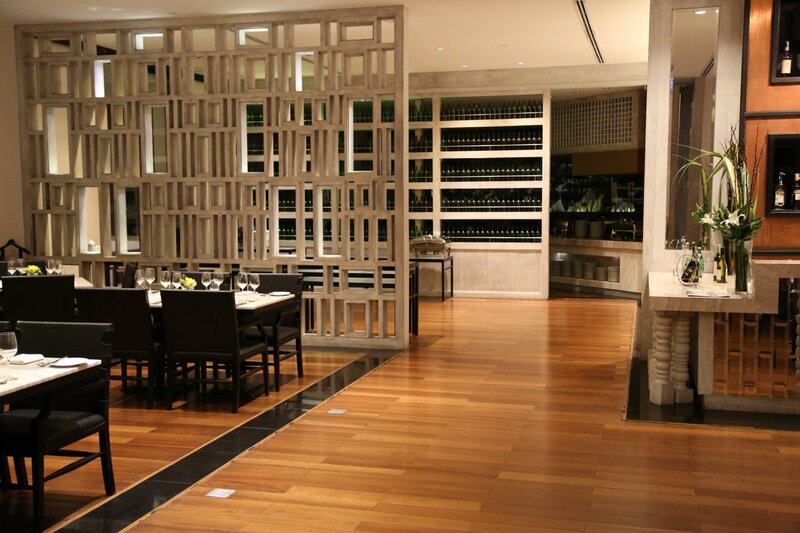 These floors are literally surrounded by glass windows so you have excellent views of Bangkok from high above. 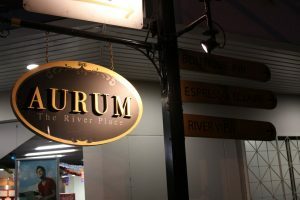 The buffets are all you can eat Sushi, German, & Thai food and sometimes other cuisines. 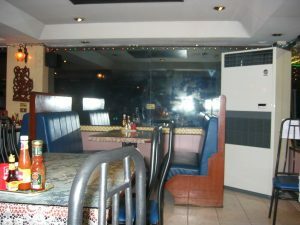 A variety of salads, meats, deserts and fruits are also available. Note that this food is not excellent but average. 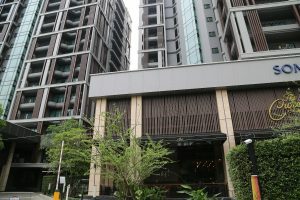 You are paying more for the views and atmosphere and experience of eating at the top of Thailand’s tallest building rather than excellent food. However, also note that during holiday season – especially in December this price may double (unless you are Thai – then the price remains lower). 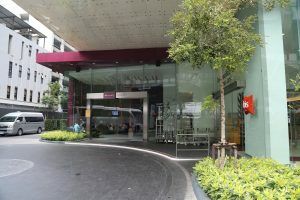 Krit Thai Residence is located opposite National Stadium on the same street that the Reno Hotel is located on (see below). This is a budget multi-story hotel which contains 80 rooms. 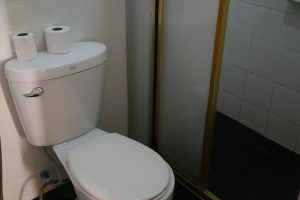 If you are sensitive to smell, they seem to have a problem with their water system – as some of the rooms smell quite musty, especially the bathrooms as the smell seems to originate from the water pipes. Reno Hotel is located not far from MBK shopping center at No 40 Soi Kasemson 1 Rama Road. This hotel is opposite National Stadium. 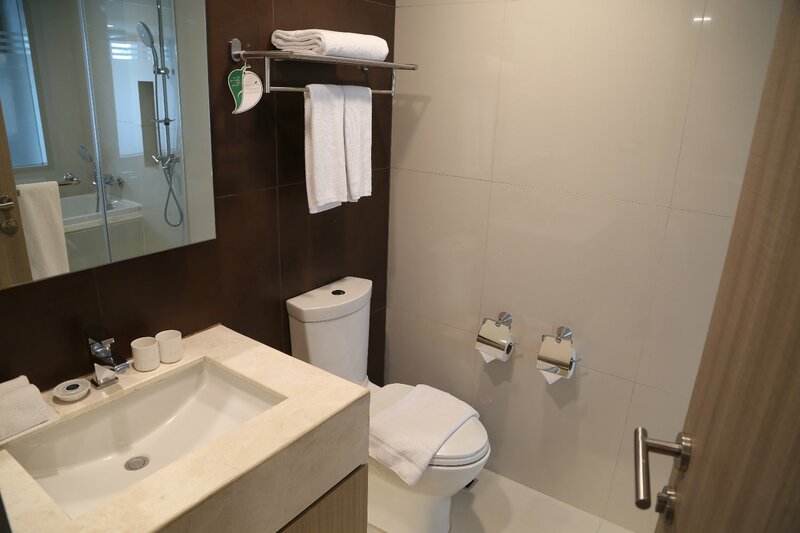 This upscale budget hotel is located near the Skytrain and major shopping centers. Nice clean rooms and friendly staff. 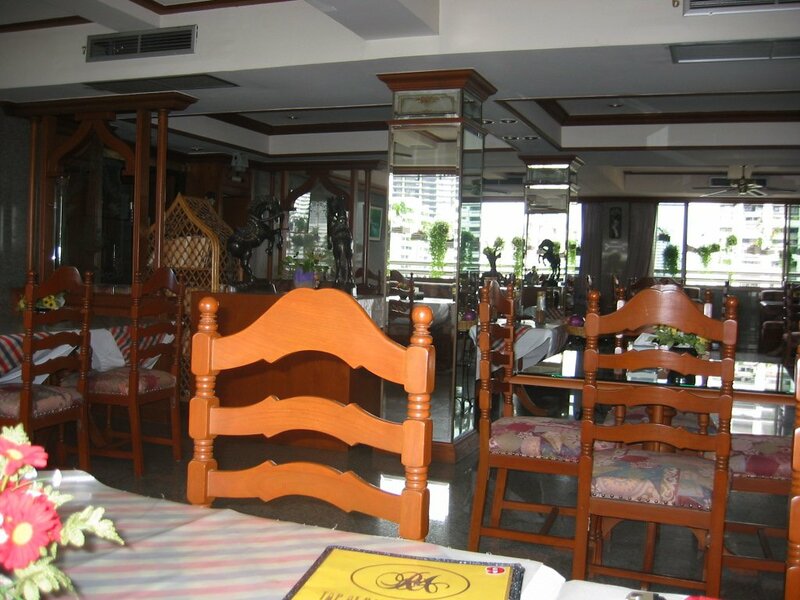 Restaurant is located adjacent to the hotel and breakfast is included with each stay. They also have a nice swimming pool! 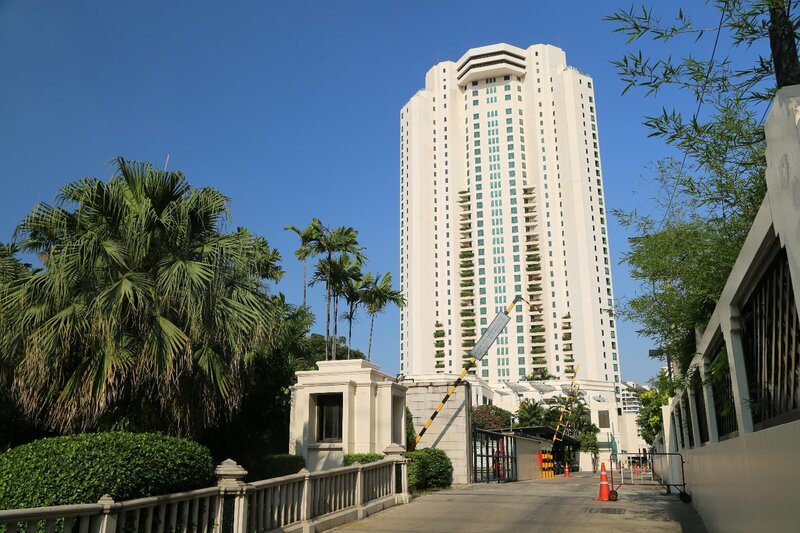 Despite being located minutes from major shopping centers their location is somewhat isolated and you don’t have the feeling of being surrounded by the “urban jungle”. It is also fairly quiet at night. For more information visit www.renohotel.co.th. There are several other guesthouses on this small street, but The Reno Hotel is the nicest one of them. Victory Monument Stay around Victory Monument. Hotel de Bangkok is located at 133/48, Ratchaprarob Soi 12, Makkasan, Ratchathewi. 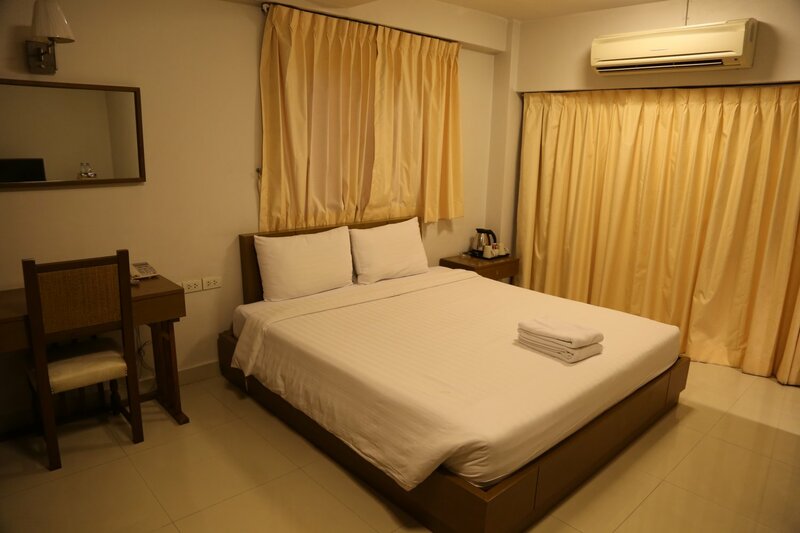 This hotel is conveniently located near the airport rail connecting link to Suvarnapumi Airport (at the Ratchaprarop stop). It is about a 15 minute walk to either Victory Monument or the Phayathai Skytrain stops. The hotel itself is located on a small soi off of the busy Ratchaprarop Road. Within minutes you can be enjoying street food or a slightly further walk brings you to a several small massage businesses. 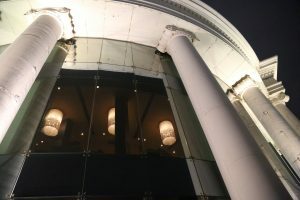 The hotel is four story – a large pull in at the entrance for taxis with a porter out front ready to help with your luggage when you check in. 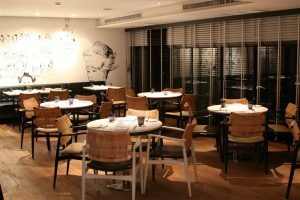 The main floor also contains a side room and tables for dining. 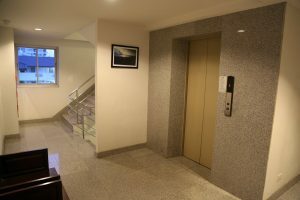 The hotel is clean and modern looking – only the inside of the elevator looks like it belongs in a hotel of a lower standard. 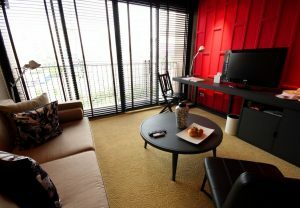 The rooms are decent sized with firm beds and outside balconies. 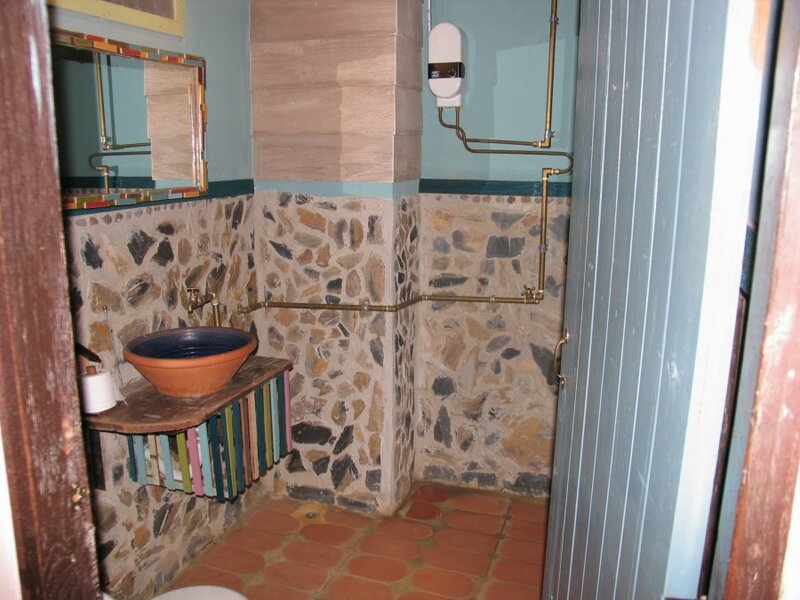 Also a nice bathroom. Breakfast is simple – fruit, soup, and eggs, sausage etc. The wifi works well throughout the hotel (from our testing) and is fast. 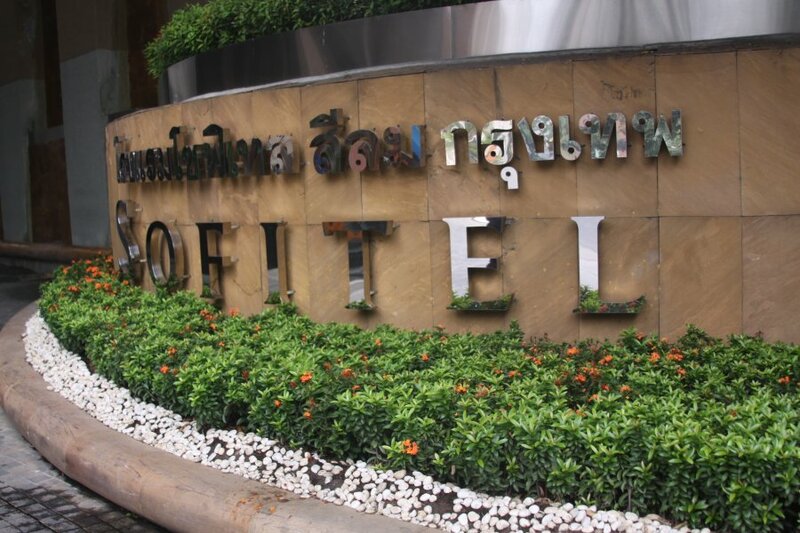 Other These are hotels that do not fall in any of the above Bangkok district categories. 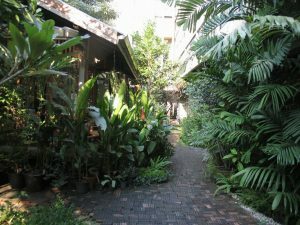 Cozy Bangkok Palace is located in a very small area of what feels like “old Bangkok” – it is in a residential area with few shops. The address is: 41/146-148 Soi. Sunthonpimol, Rama 4 Rd., Rongmuang, Prathumwan. 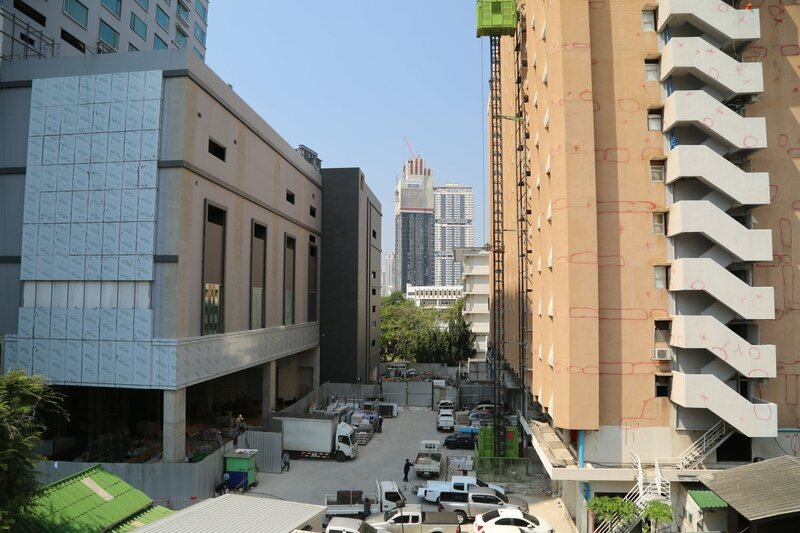 It is surrounded by tall buildings and large raised roads including the huge Rama IV, but for some reason this tiny area has escaped being totally developed. Because of its location surrounded by small streets it can be somewhat confusing for taxi drivers to find. They do have a map on their website; print this out and take it with you. 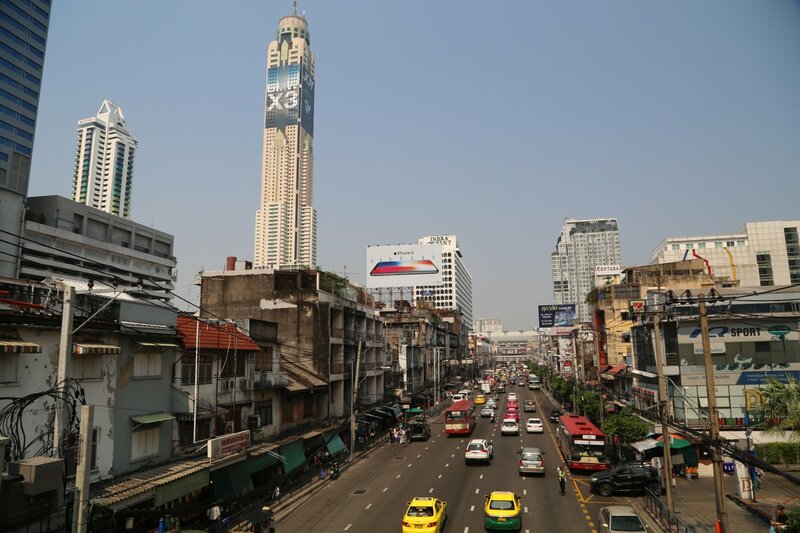 It is about a 5 minute walk to the closest bus station and a 10-12 minute walk to the Hua Lamphong Metro stop (which is the last stop at this end of the Metro). 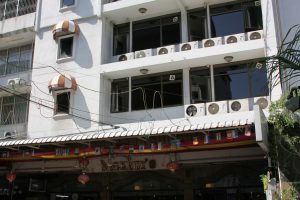 The hotel is also located within about the same distance walking of the big train station and Chinatown. Wow, you sure have plenty of places listed! 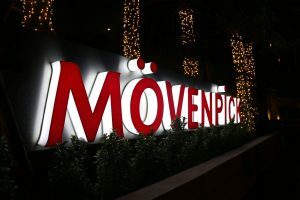 My BF and I are planning our trip to Bangkok (and Phuket) and I stumbled across your link to your Bangkok guide on Twitter. 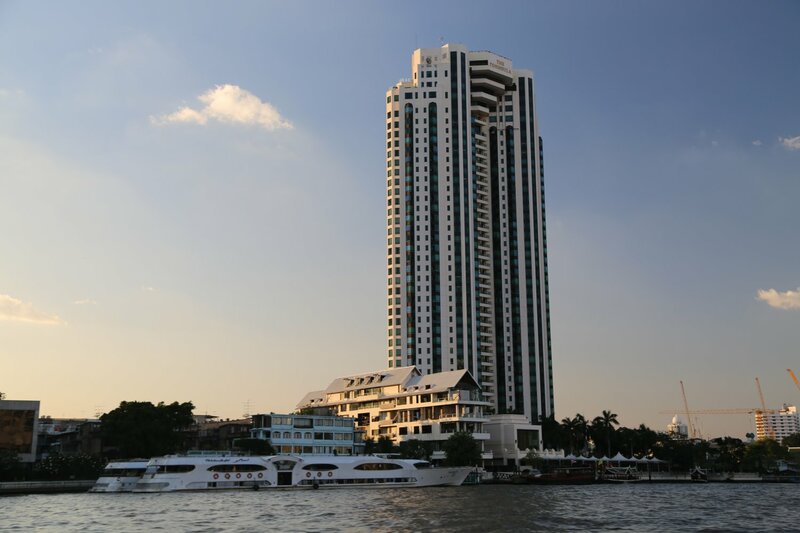 We are thinking of staying down by the river – and then catch the skytrain stop to Sukhumvit area. Thanks for posting this. 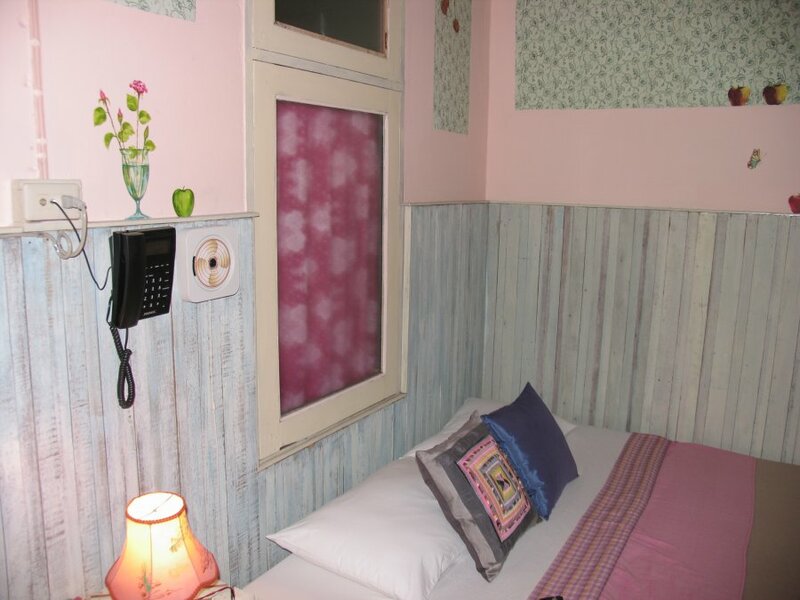 Was doing a search for a Bangkok guesthouse and your page showed up – was looking at the Canale Hostel, seems a bit expensive for a private room but maybe I’ll do the dorm room. Nice page dude.